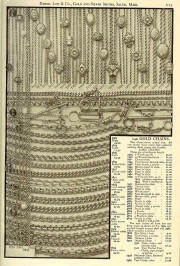 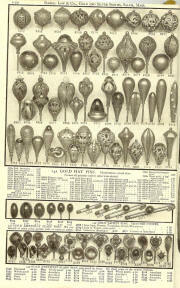 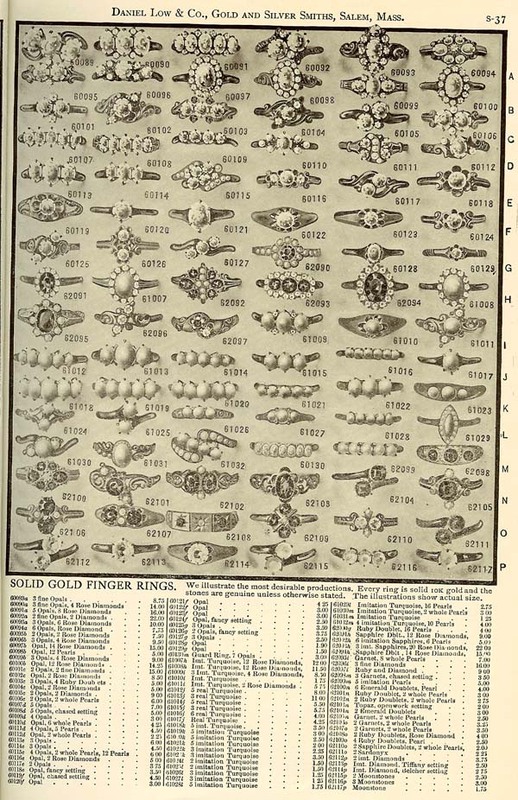 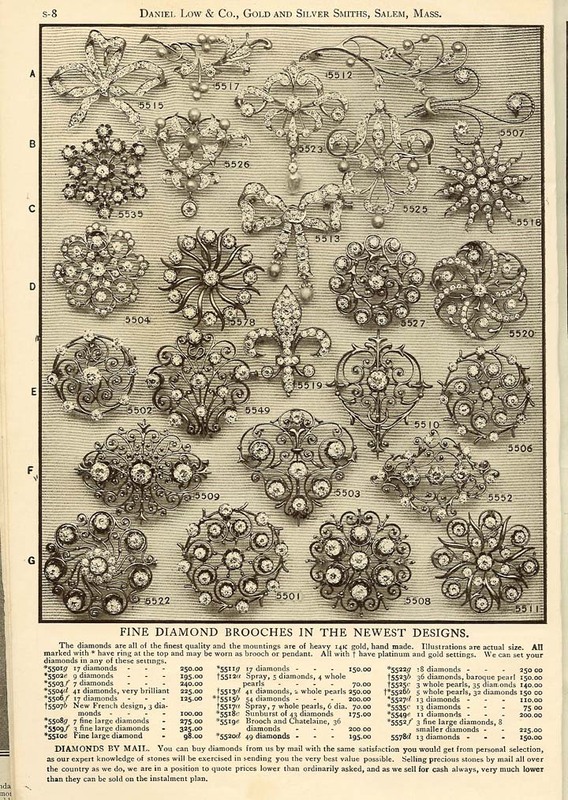 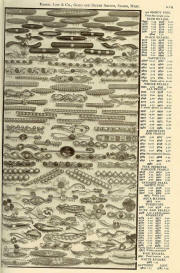 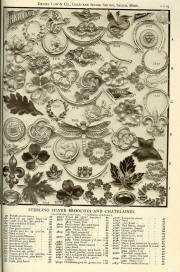 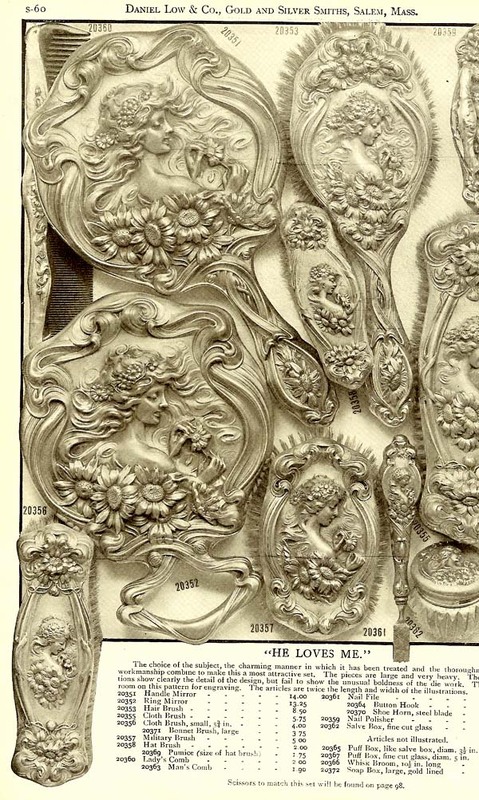 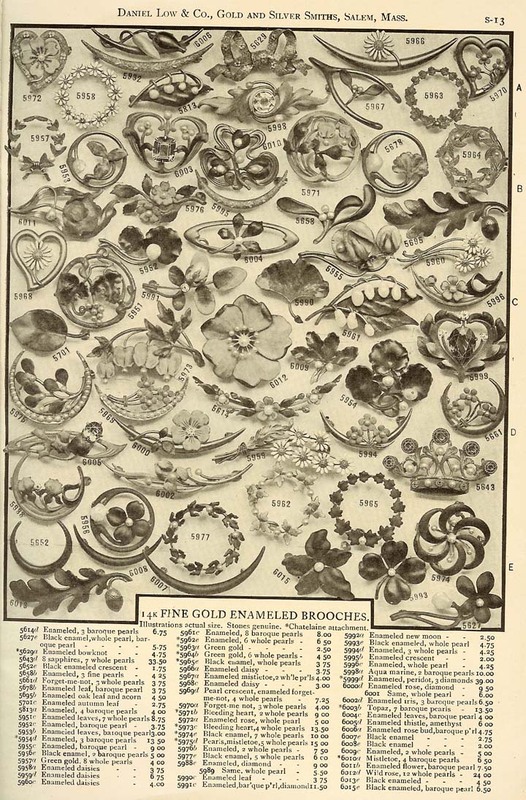 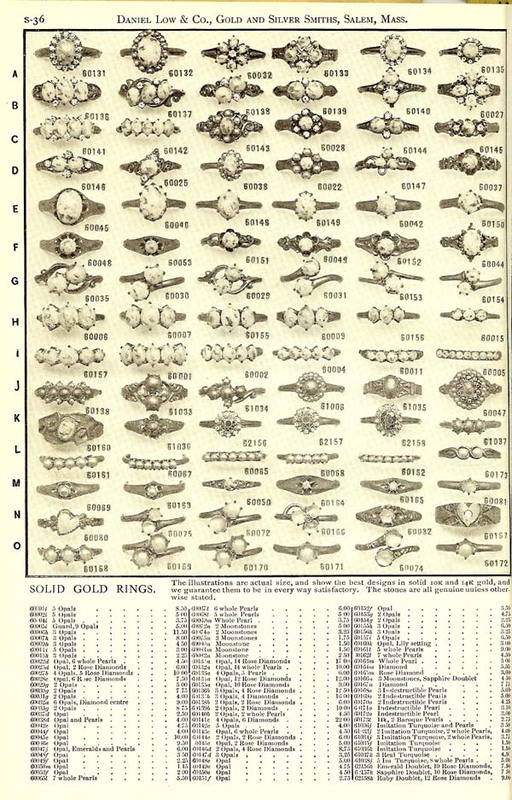 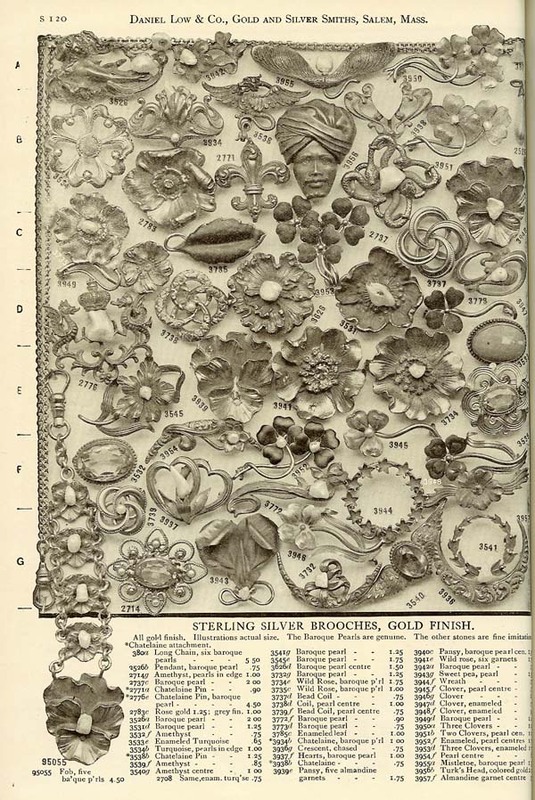 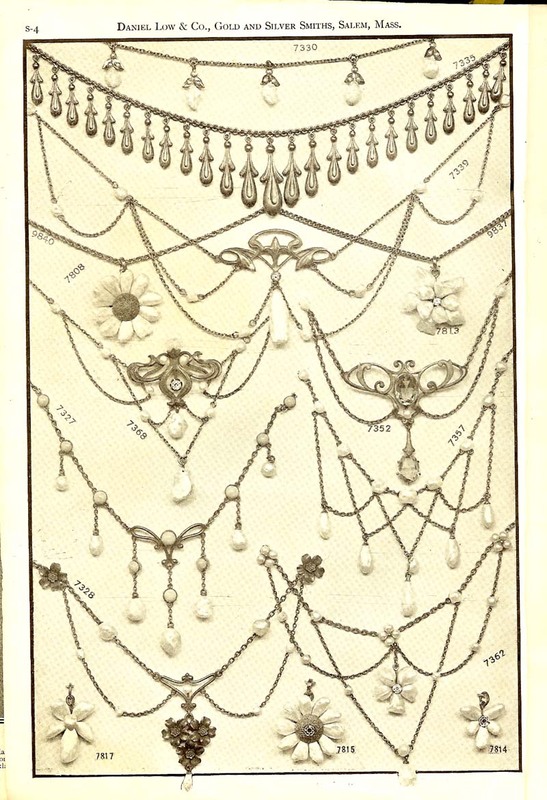 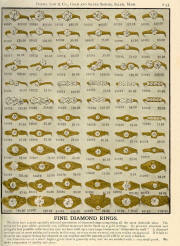 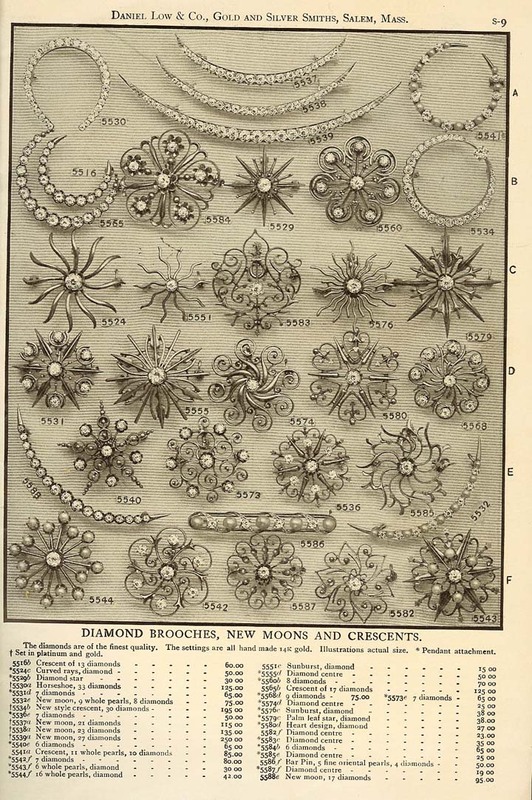 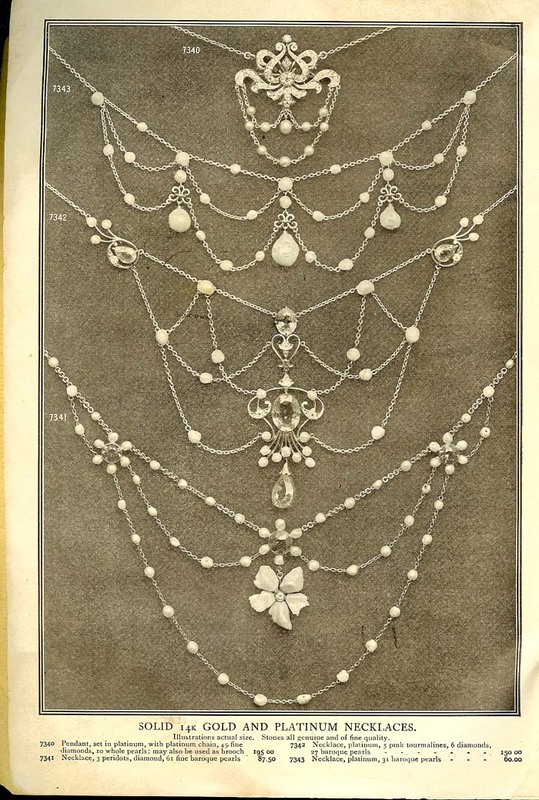 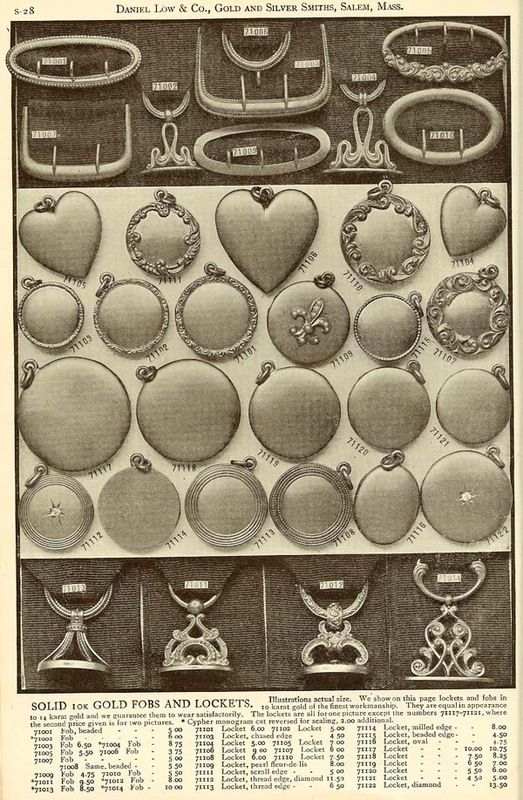 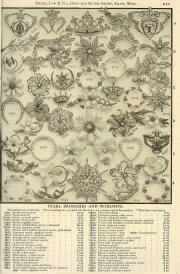 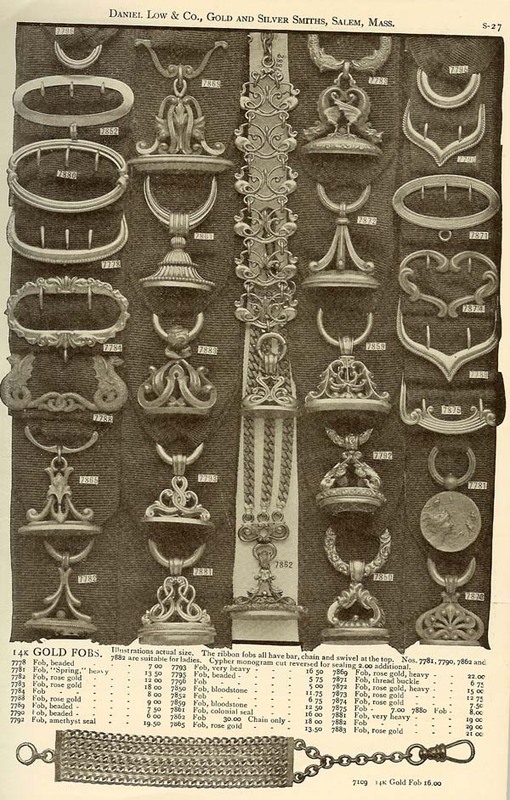 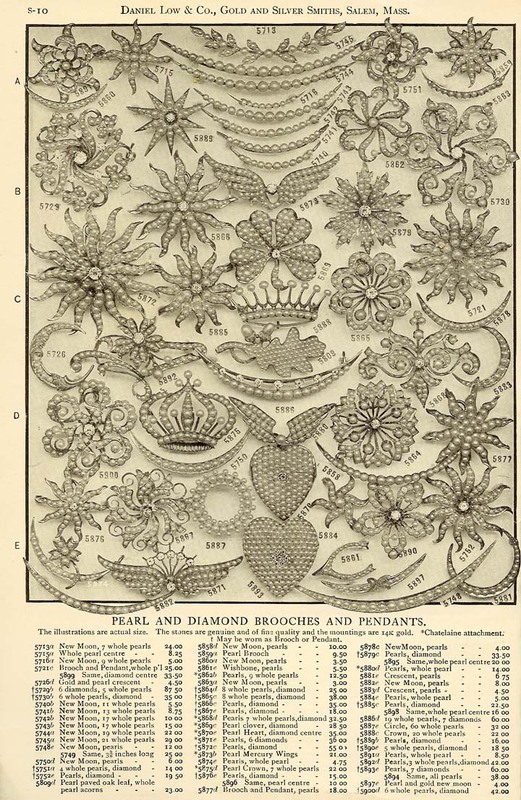 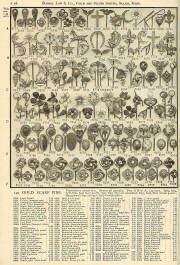 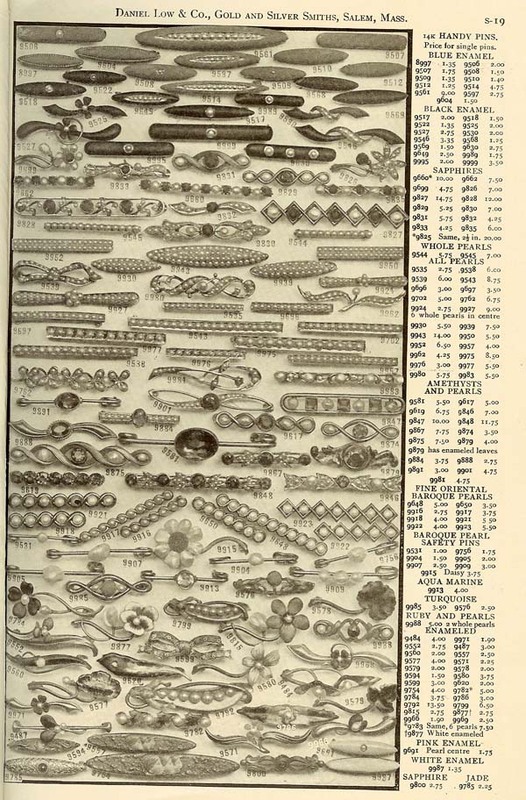 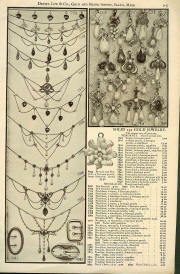 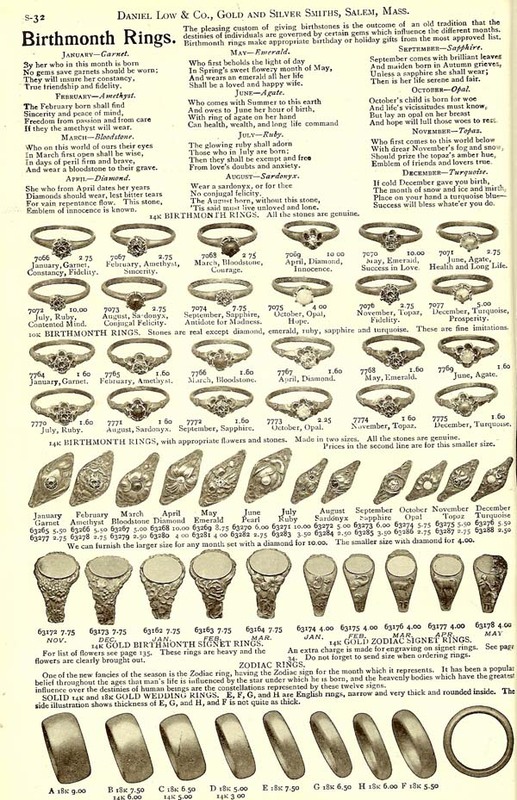 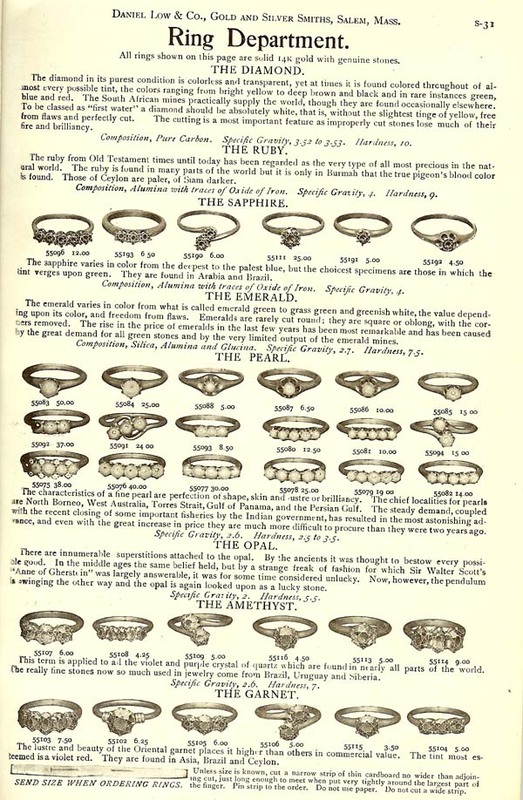 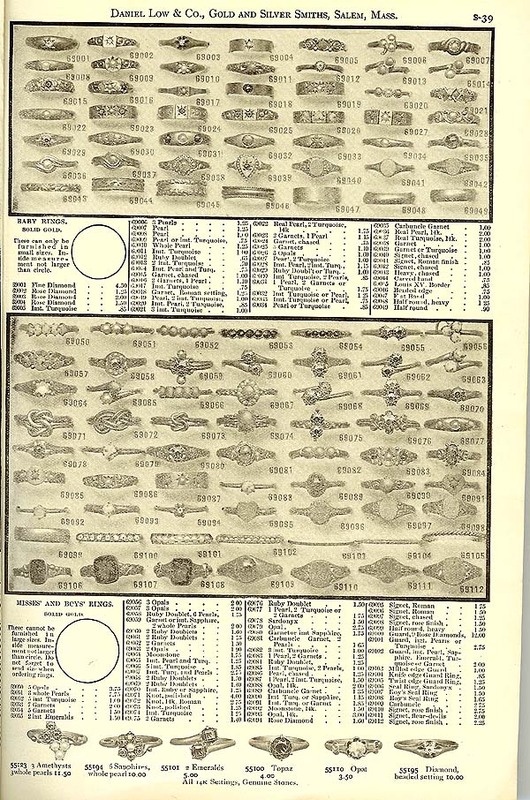 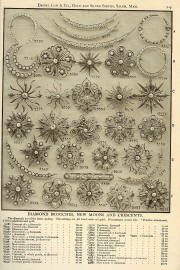 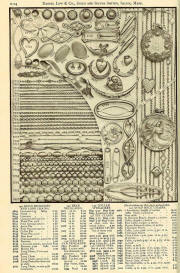 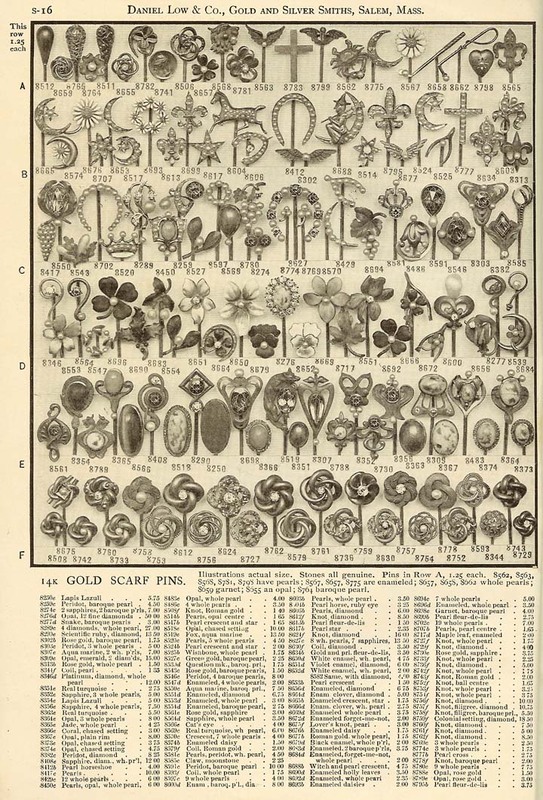 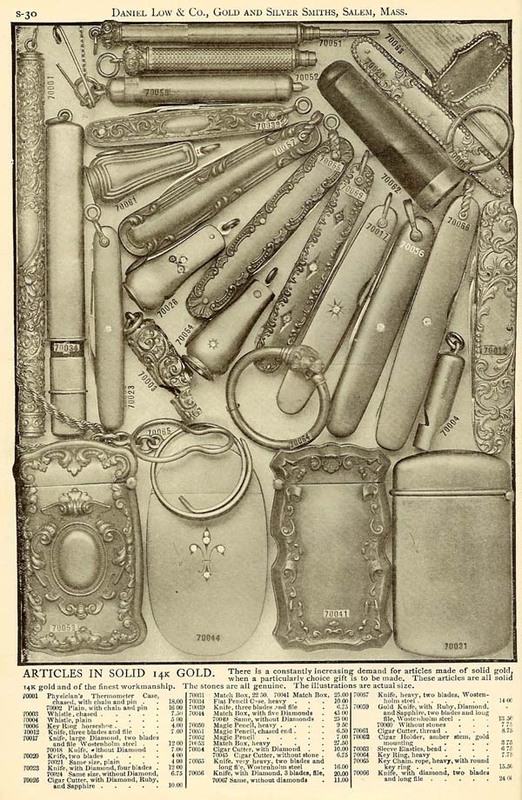 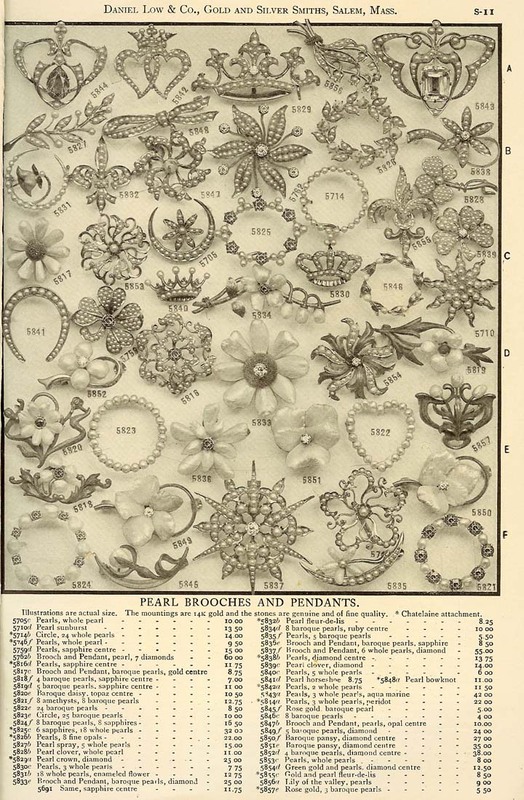 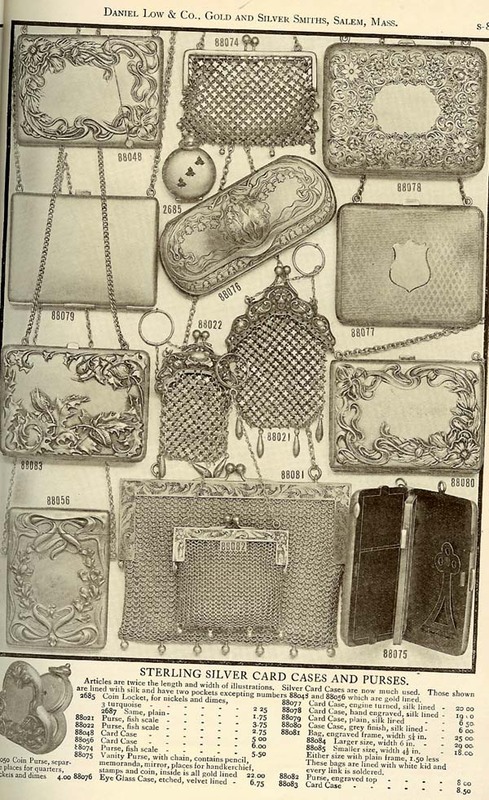 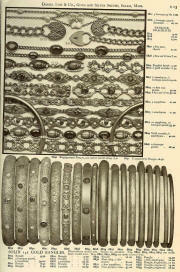 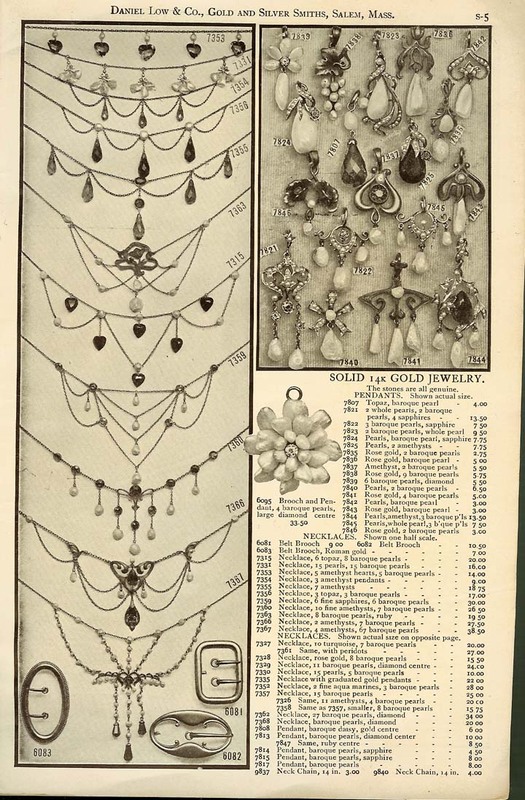 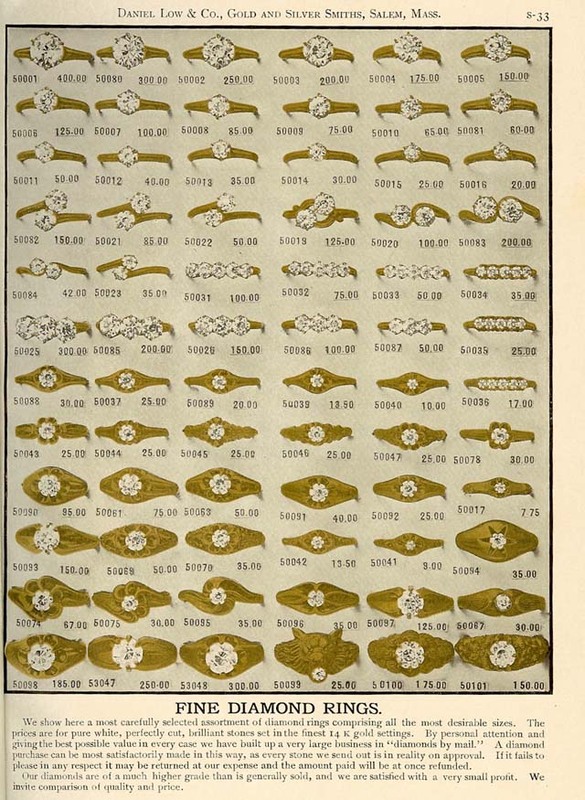 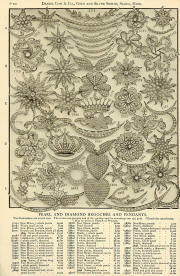 Established 1867 Older catalogues shed light on the jewelry and accessories of times past. 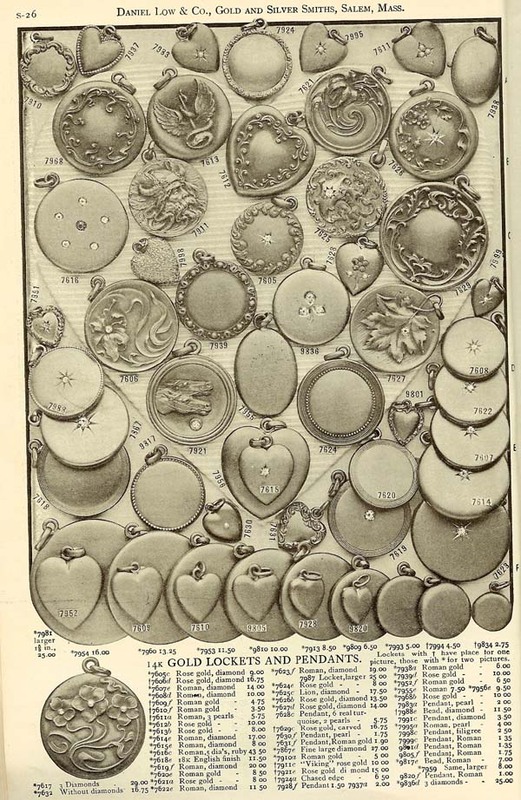 Illustrations date the items we collect and enjoy today, and help us understand how these lovely things were worn and used. 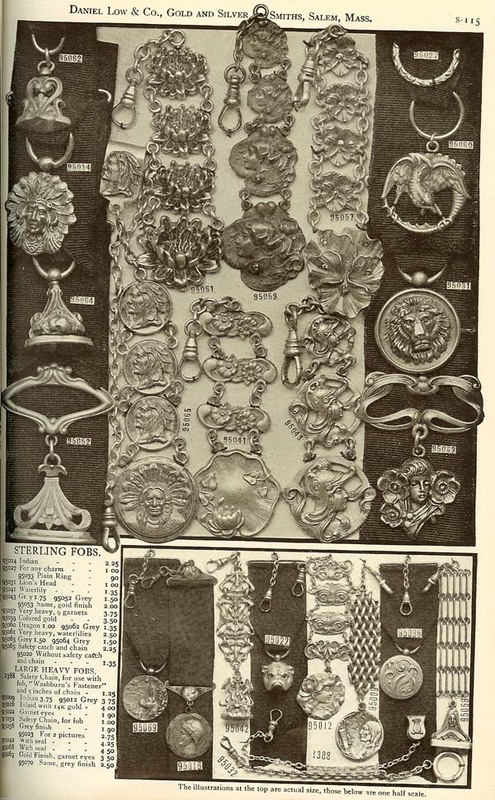 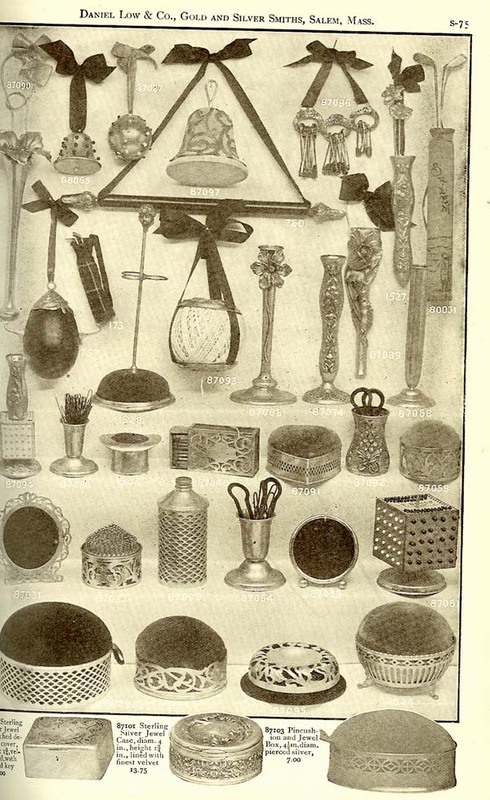 It is also interesting to see how these accessories were priced over 100 years ago. 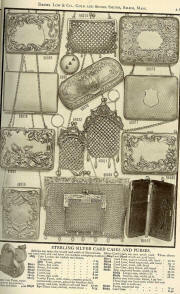 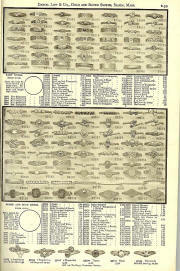 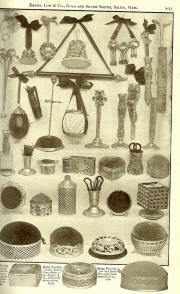 Where possible, we have added pictures of the items illustrated in the catalogue. 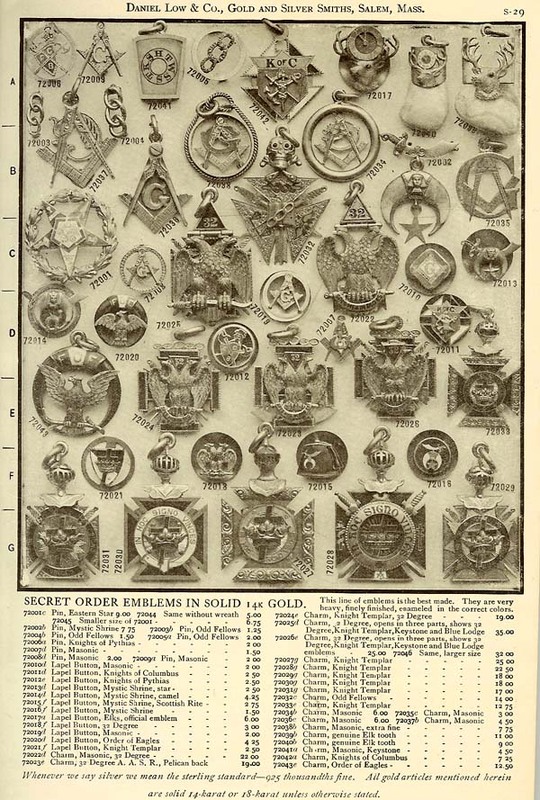 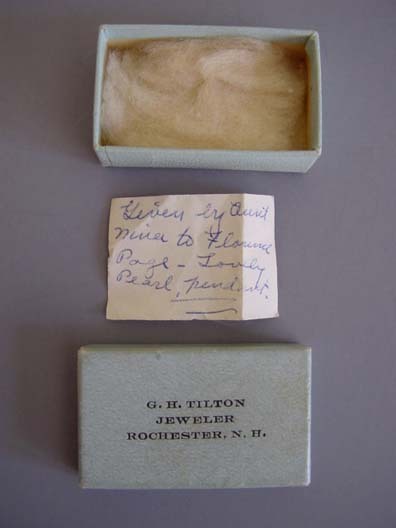 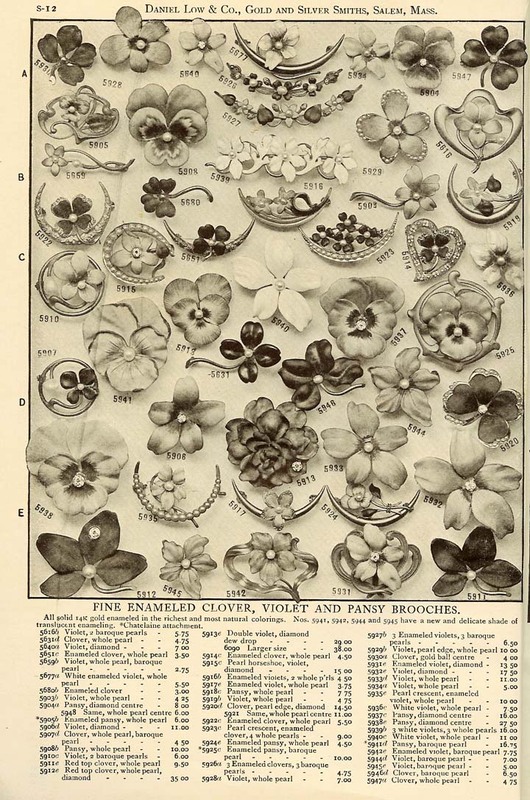 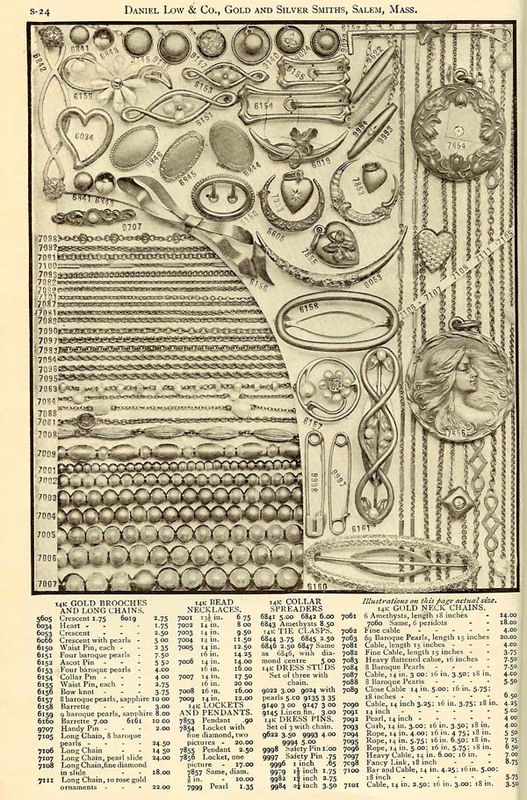 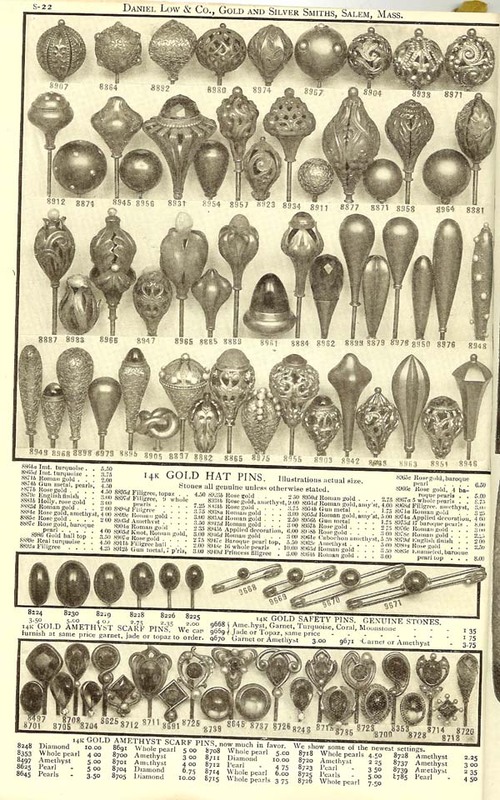 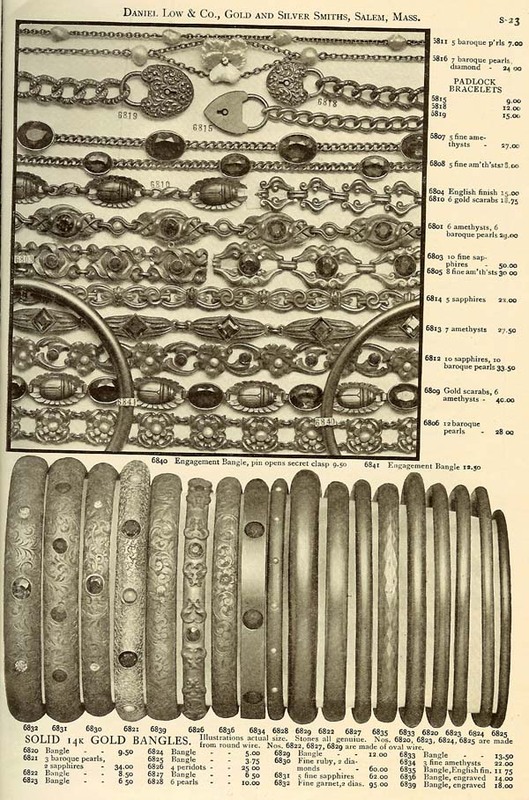 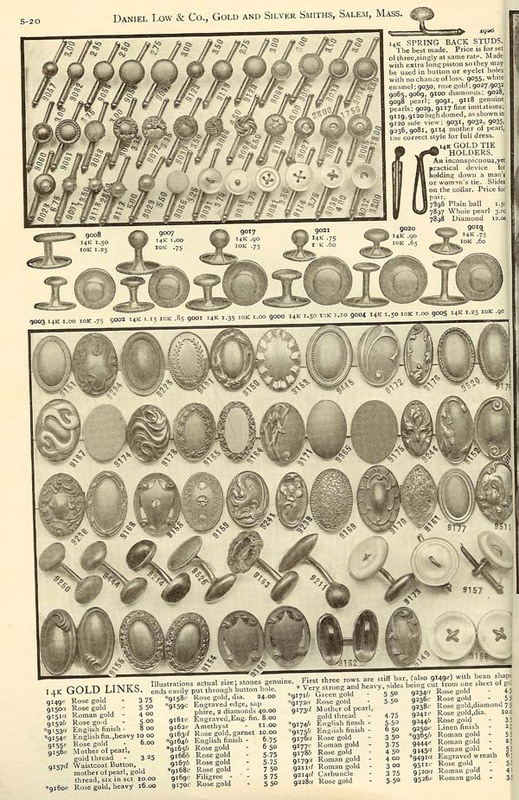 Originally a local jewelry shop, by the late 1800's, Daniel Low & Co. was distributing their gifts catalogue and selling nationally via mail order. 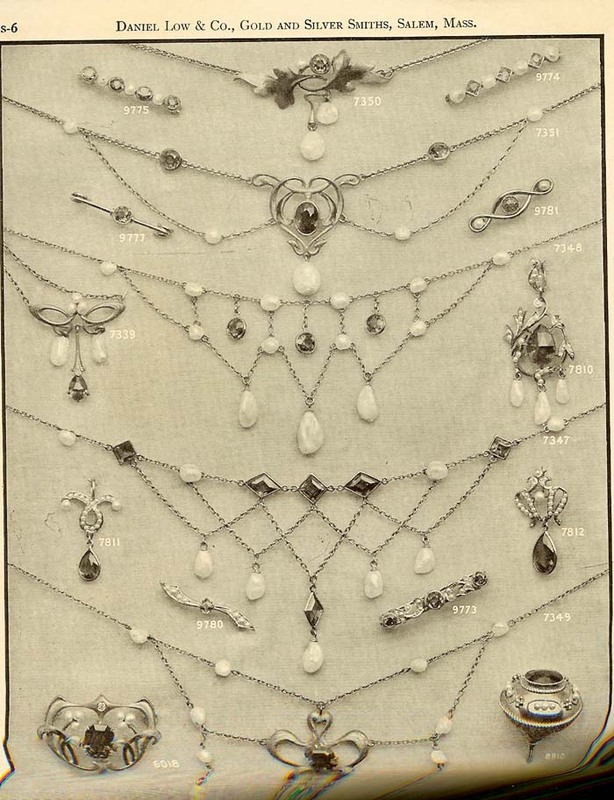 Necklaces and lavalieres. 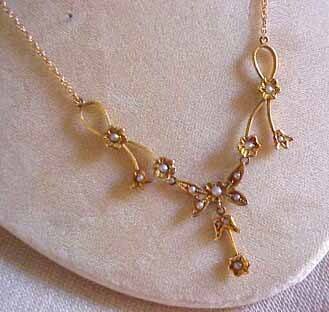 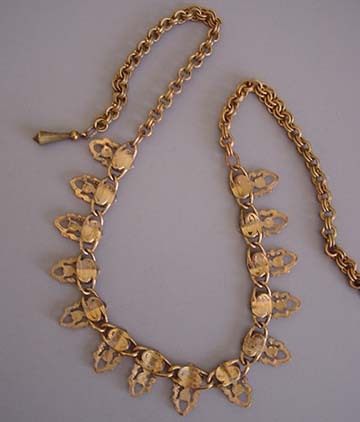 GOLD TONE Victorian style gold tone necklace 17" by 5/8". 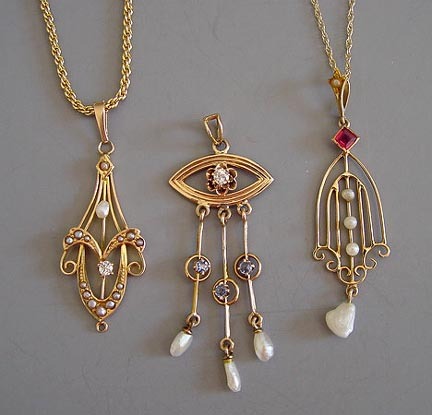 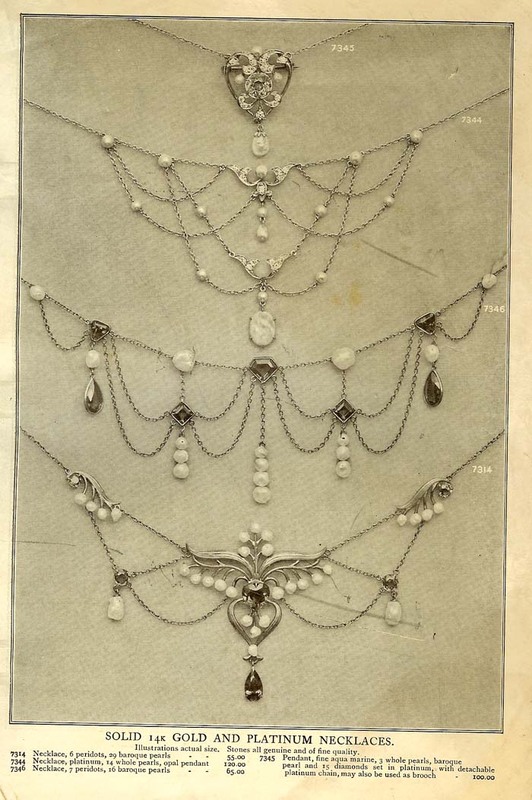 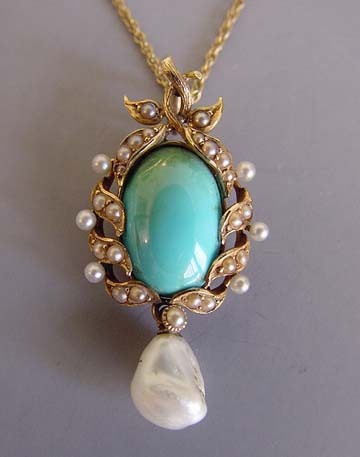 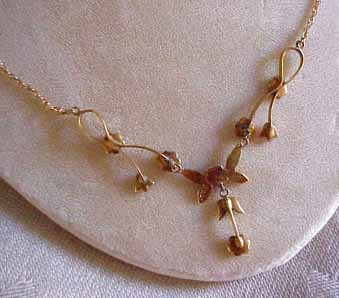 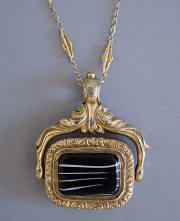 View View View #Q29780 Necklaces and lavalieres in Edwardian and Art Nouveau styles. 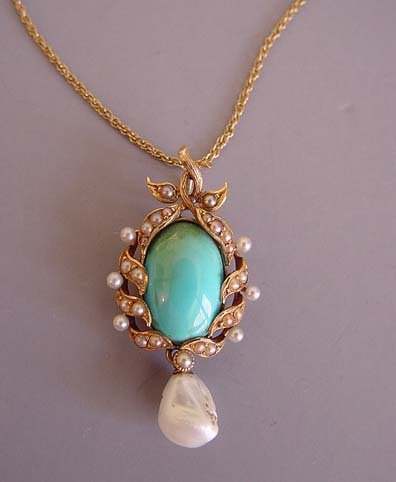 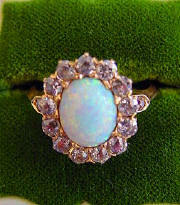 SOLID 14k gold jewelry with genuine topaz, baroque pearl, amethyst, turquoise, peridot, aquamarine ruby and diamond stones. 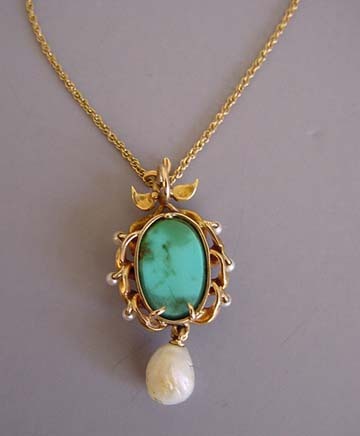 10K YELLOW GOLD Edwardian lavaliere with aqua Persian turquoise center stone and seed pearls with fresh water pearl dangle, 1-1/4". The box it came to me in has a note in an old turn-of-the-century script. 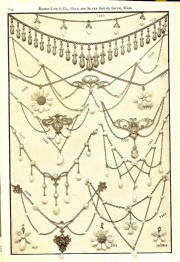 View View View View #Q29656 SOLID 14k gold and platinum with citrine, baroque pearl and diamond necklaces. 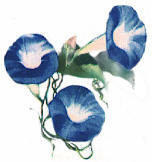 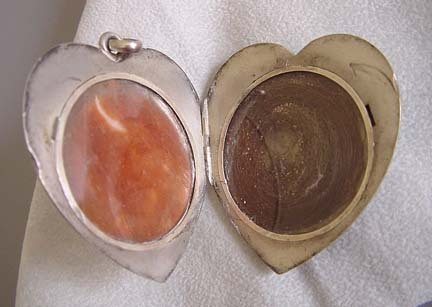 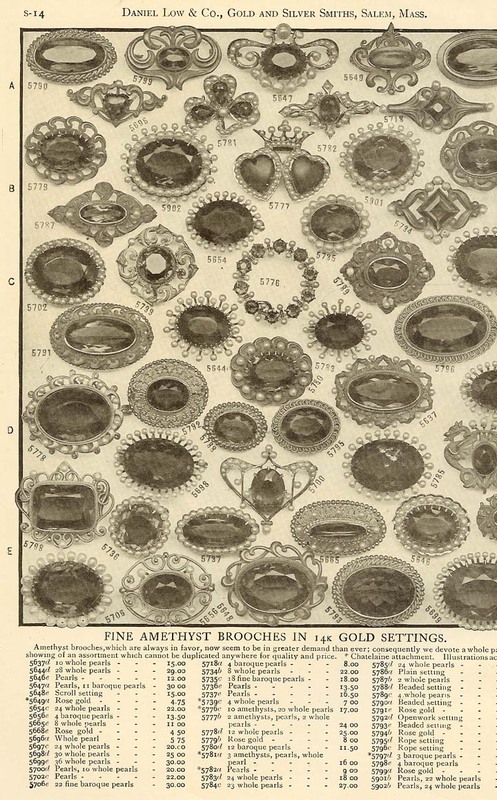 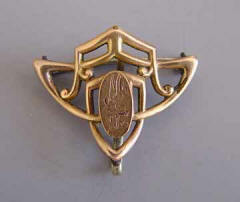 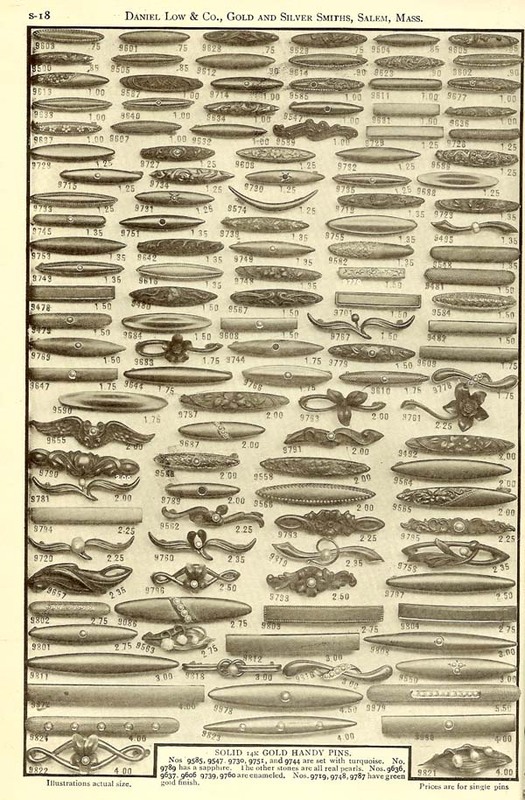 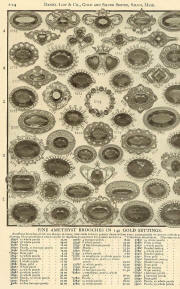 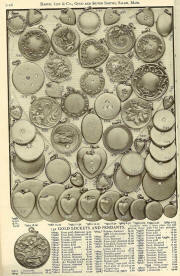 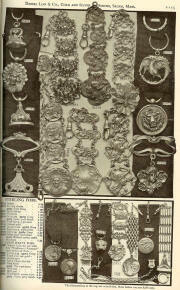 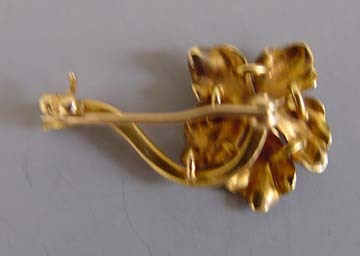 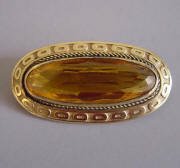 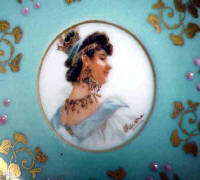 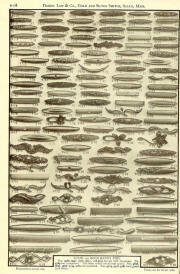 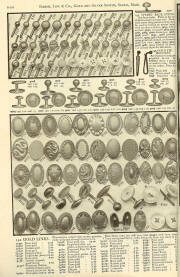 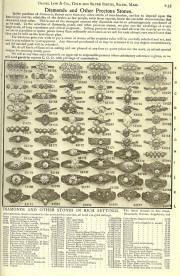 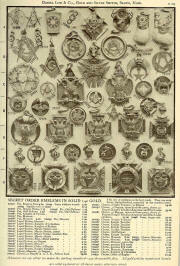 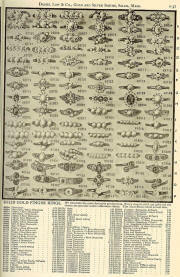 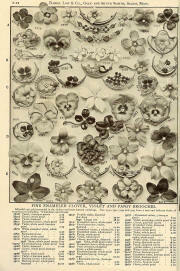 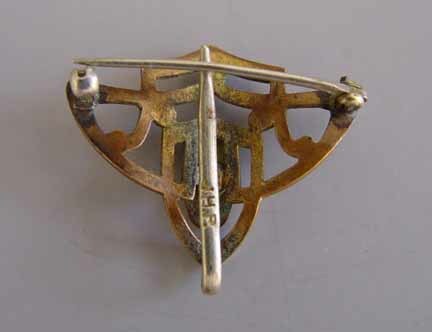 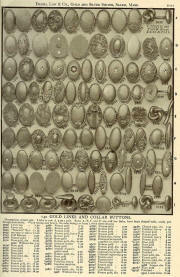 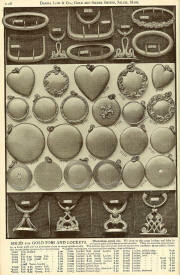 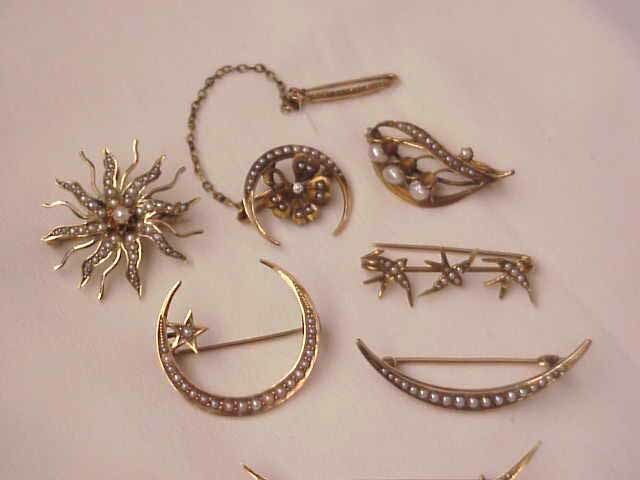 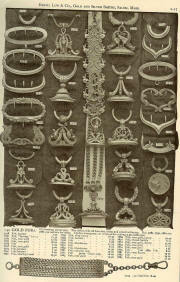 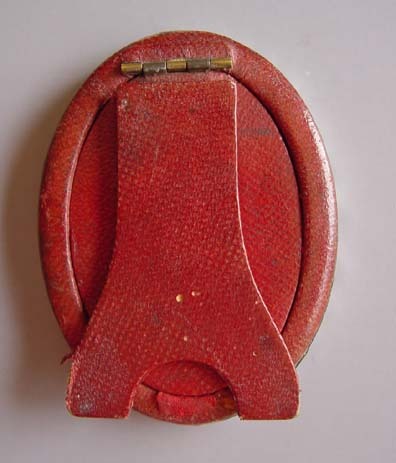 Some may be detached and worn as brooches. 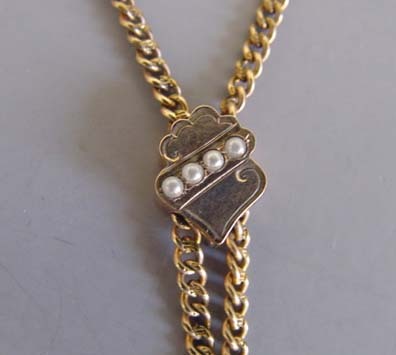 SOLID 14k gold and platinum with baroque pearl and diamond necklaces. DIAMOND brooches, new moons and crescents with diamonds and pearls set in 14k gold. 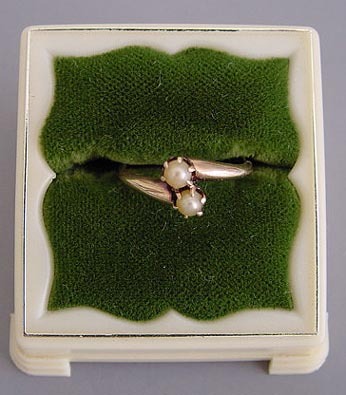 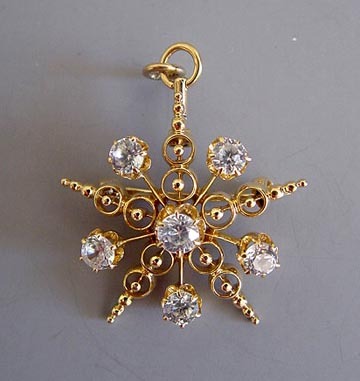 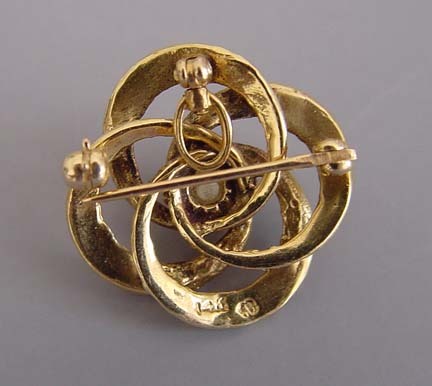 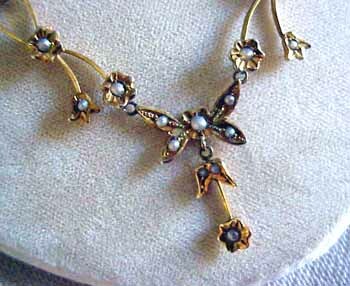 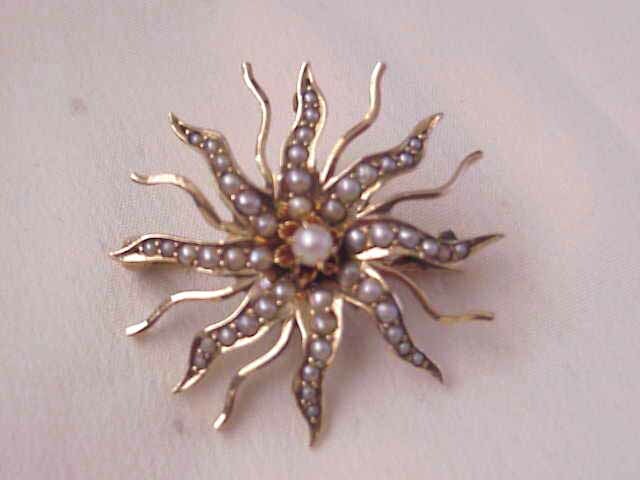 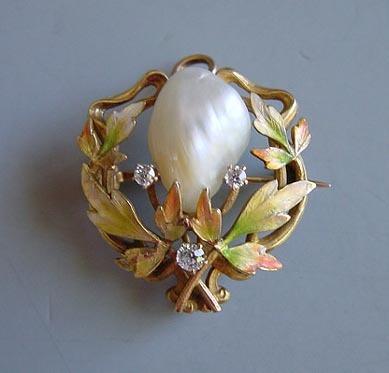 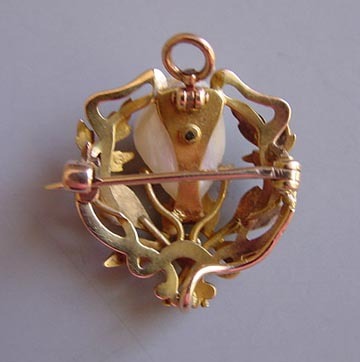 Seed pearl starburst brooch with pendant loop, set in 14k yellow gold, circa 1900. 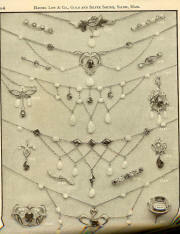 Seed pearl jewelry. 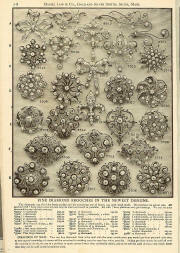 #Q22923 FINE diamond brooches in the newest designs, some of which have a pendant loop at the top. 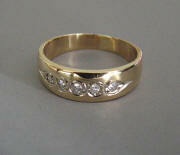 Diamonds set in 14k gold. 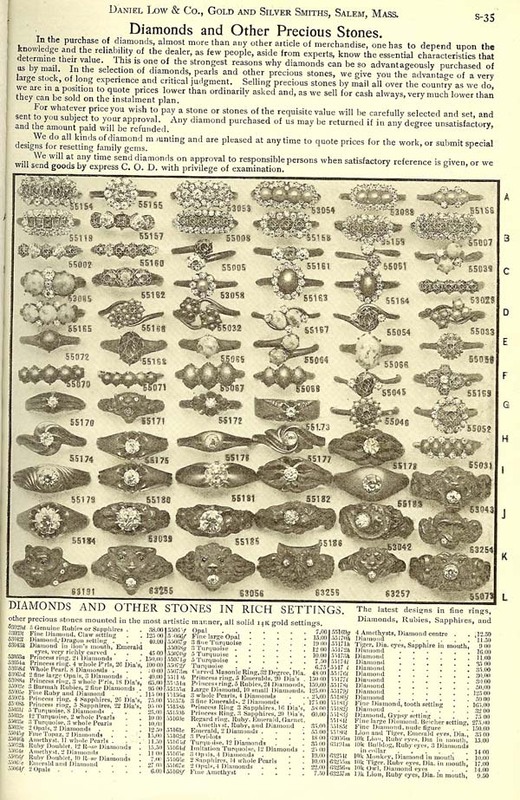 "We can set your diamonds in any of these settings." 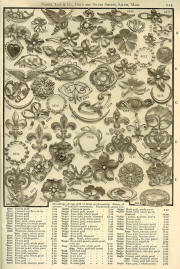 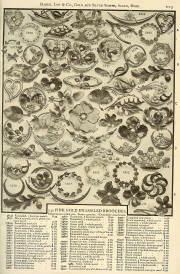 Designs include fleur-de-lis, starbursts, bows, chatelaines, branches and circles. 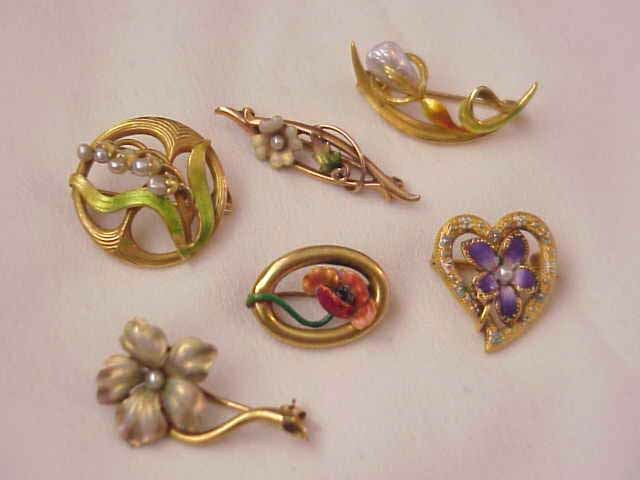 FINE ENAMELED clover, violet and pansy brooches. 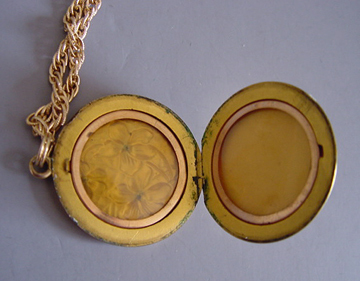 All solid 14k gold in the richest most natural colors, some with a new and delicate shade of translucent enameling. 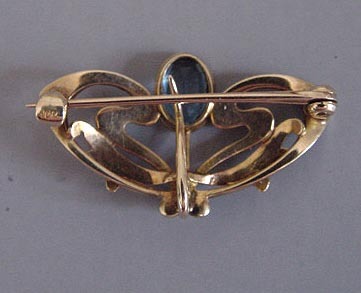 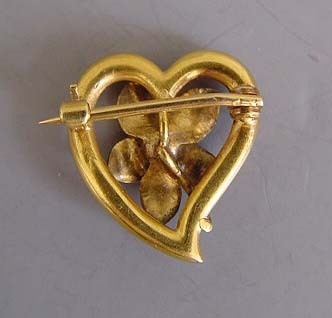 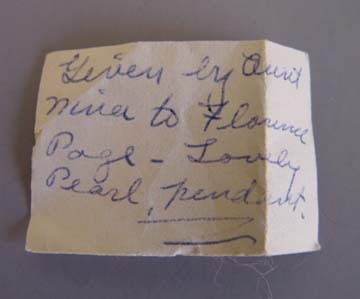 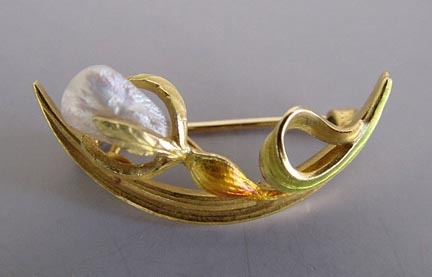 14k ENAMELED and pearl 1-1/8" violet pin, marked on the catch with an arrow through a heart mark, circa 1910. 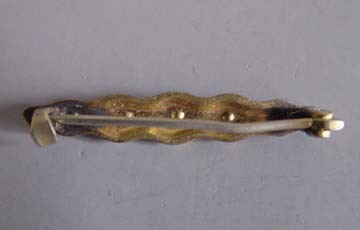 This pin has very slight enamel loss. 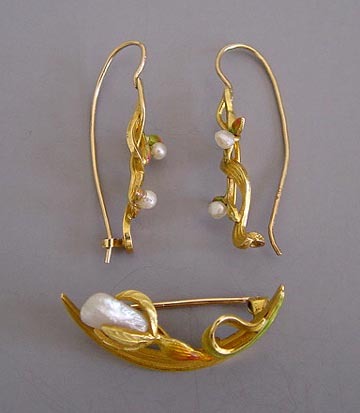 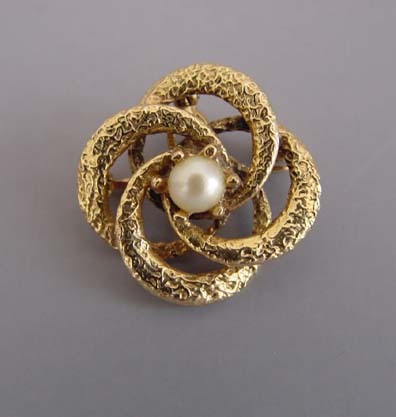 View #Q11738 PEARL brooches and pendants set in 14k gold. 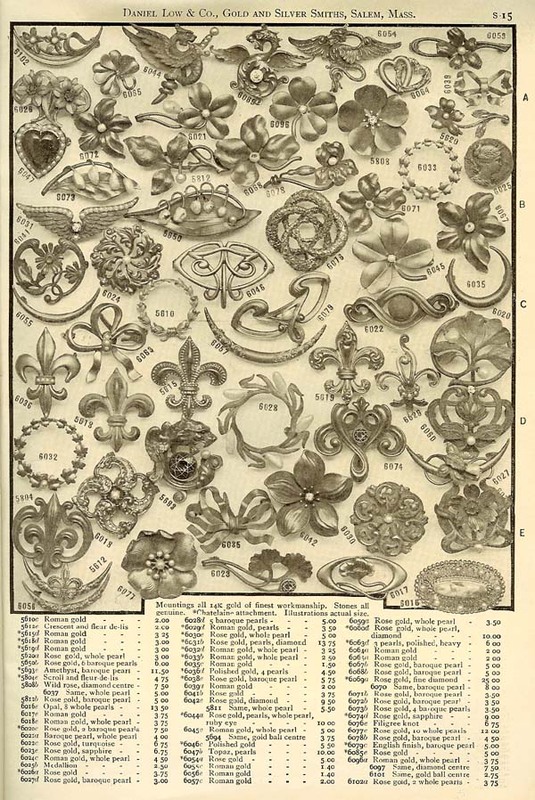 Flowers, crowns, lucky horseshoes, wreaths, starbursts, fleur de lis and Art Nouveau designs. 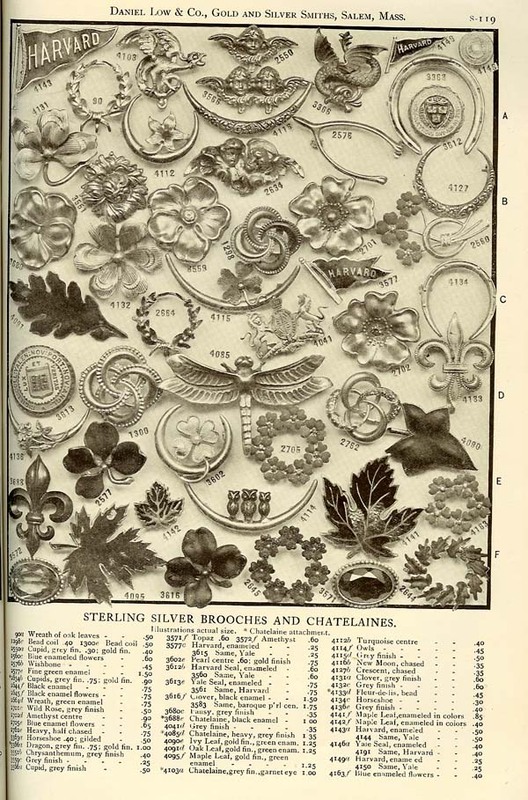 STERLING silver brooches and chatelaines. 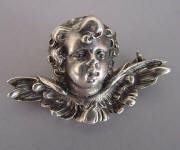 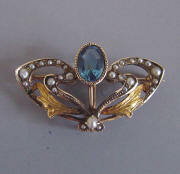 View SILVER marked "F&B 800" winged cupid brooch circa 1910, 1-1/3". 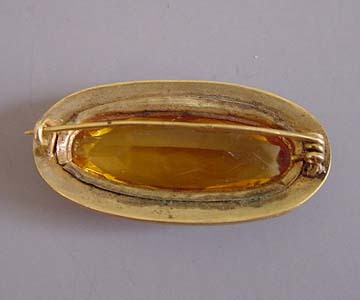 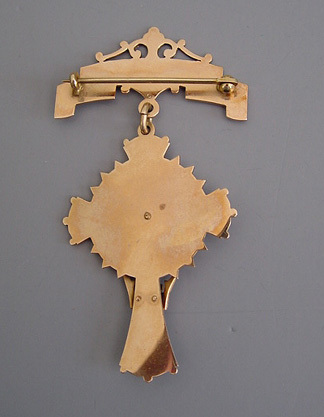 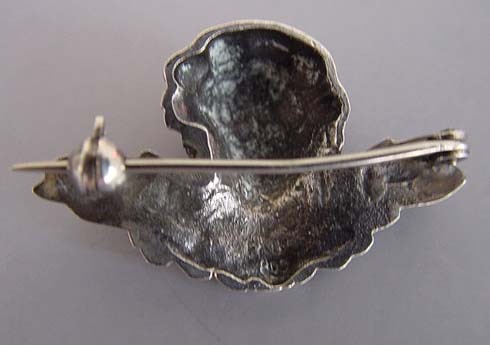 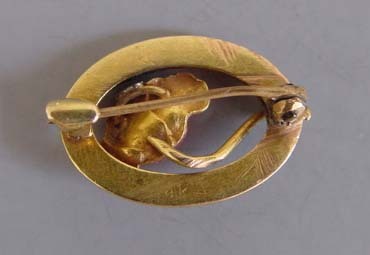 See similar piece in Romero's Warman's Jewelry, Ed. 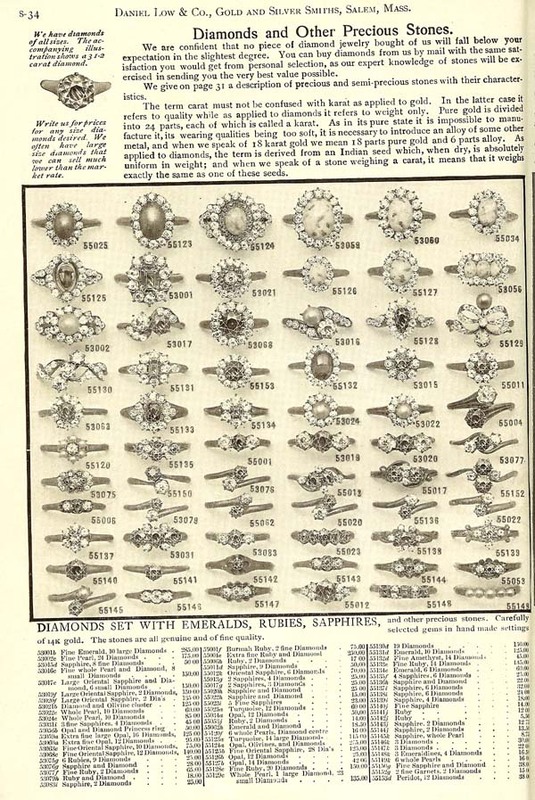 3 page 115. 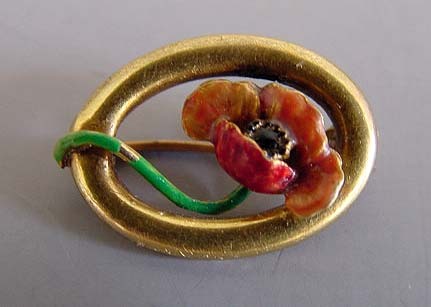 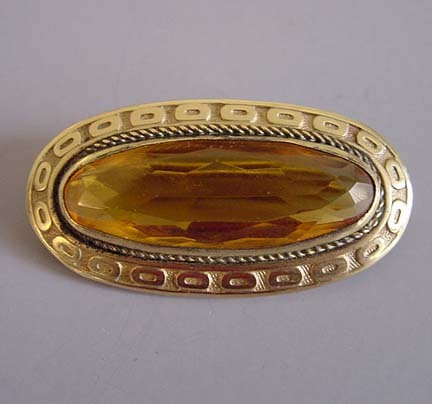 View #N28910 14k FINE gold enameled brooches. 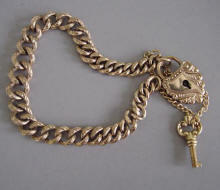 VICTORIAN 1" heart and key clasp embossed links 7" bracelet, circa1880. 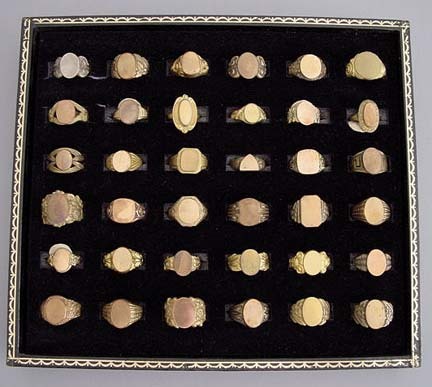 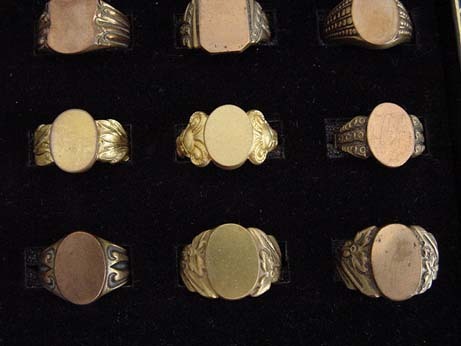 #V27351 MOUNTINGS all 14k gold of finest workmanship. 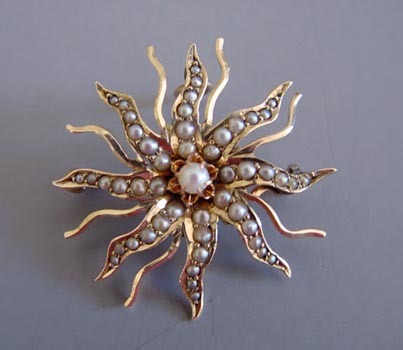 PEARL and diamond brooches and pendants. 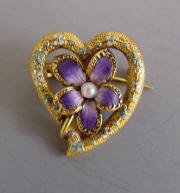 14k gold crosses, hearts, lockets and pendants with genuine stones including amethysts, topaz and pearls. 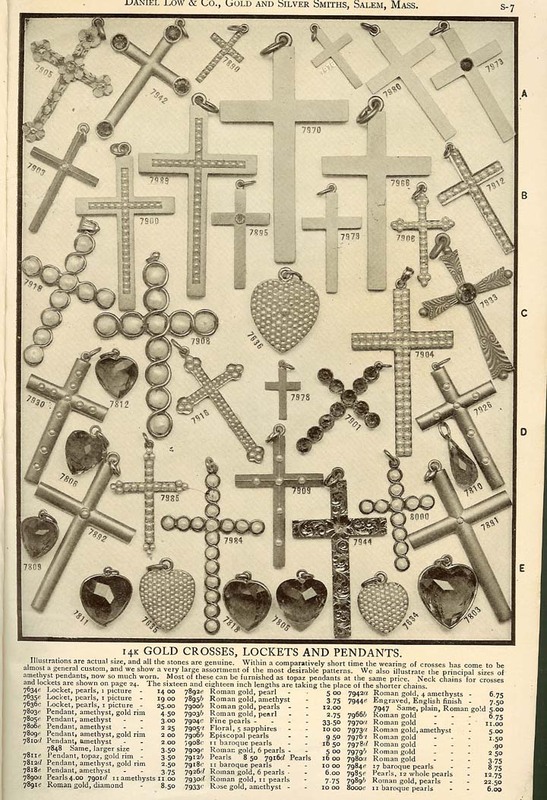 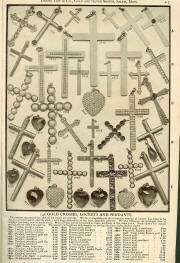 "Within a comparatively short time the wearing of crosses has come to be almost a general custom." 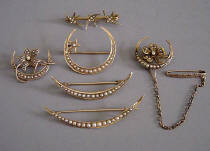 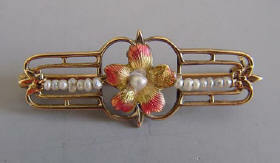 STERLING silver brooches with gold finish and baroque pearls. 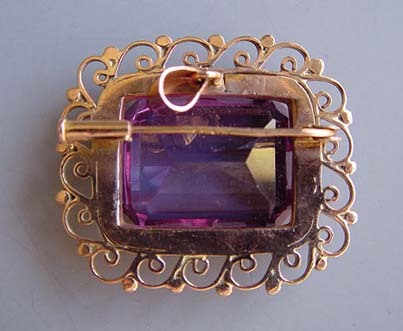 GOLD intricately framed purple faceted stone brooch with trombone catch and flip-up loop for a chain. 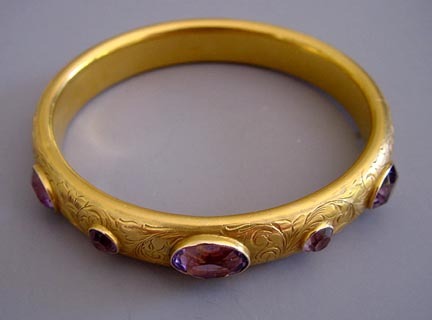 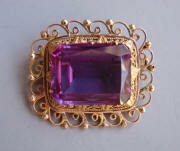 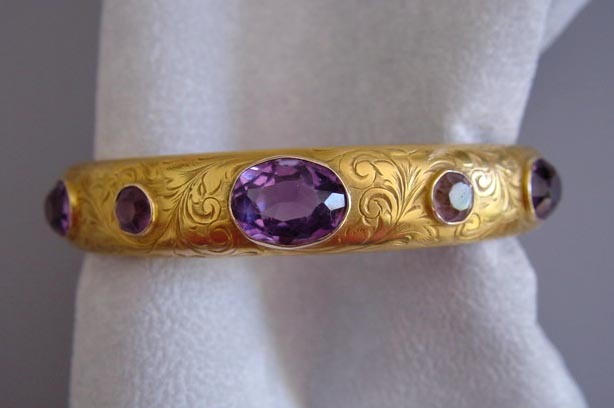 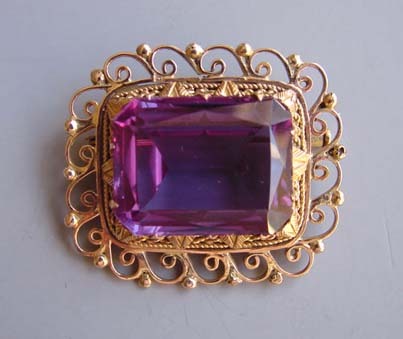 View #Q25293 FINE amethyst brooches in 14k gold settings. 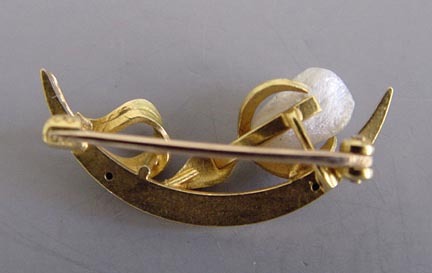 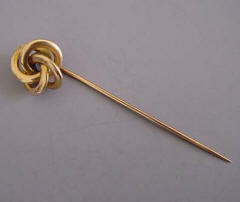 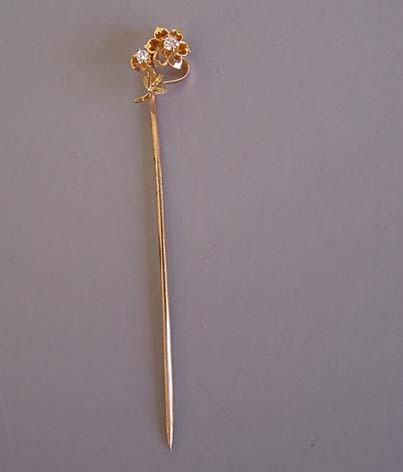 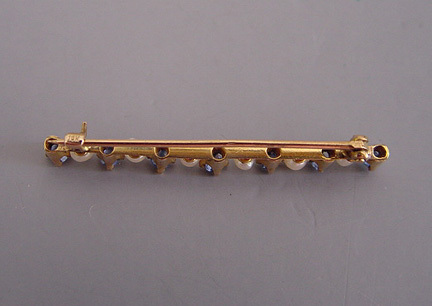 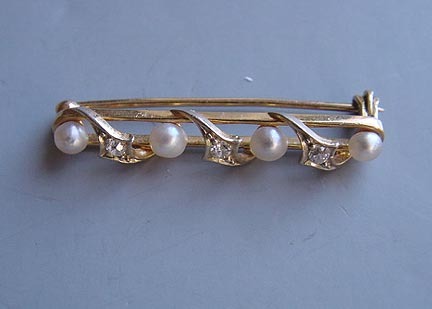 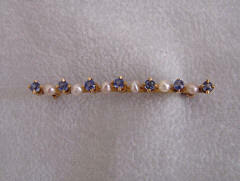 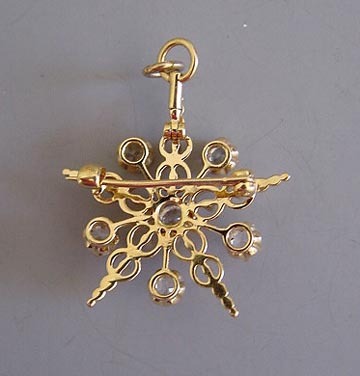 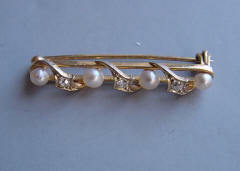 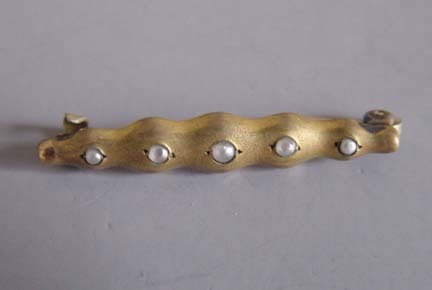 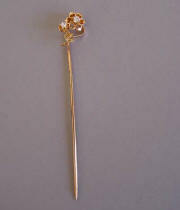 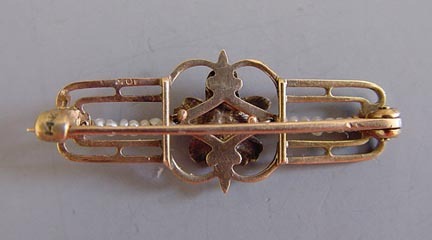 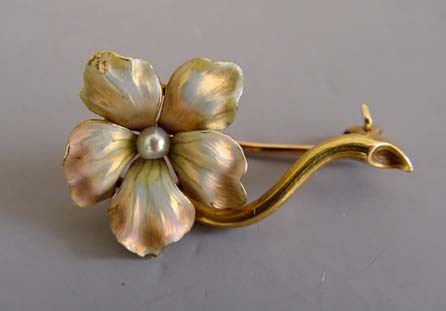 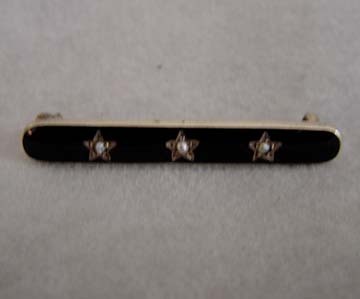 EDWARDIAN 14k yellow gold, pearl and diamond bar pin, 1-1/4". #Q27587 14k HANDY pins. 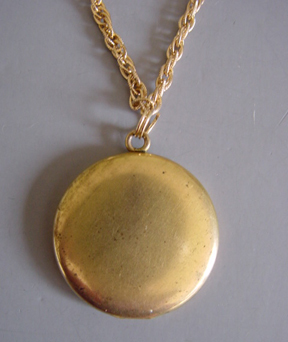 14k GOLD lockets and pendants. 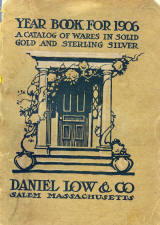 Daniel Low 1906 Catalogue. 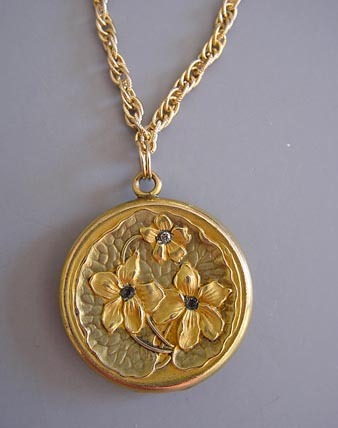 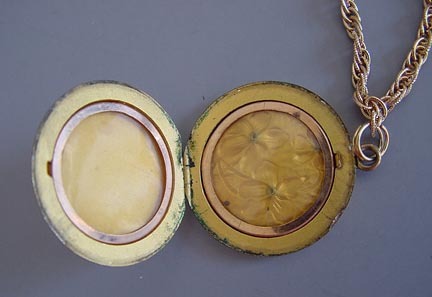 GOLD TONE embossed violets round locket with rhinestones. 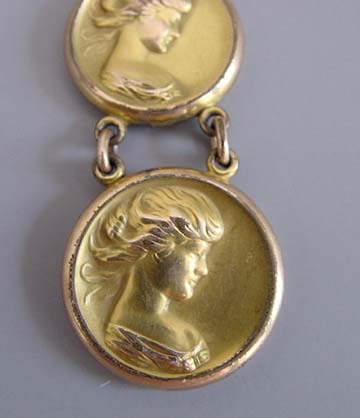 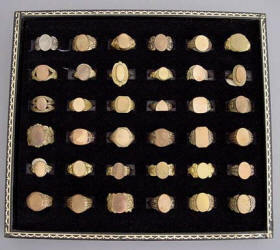 View View View #Y3682 SOLID 10k gold fobs, buckles and lockets. 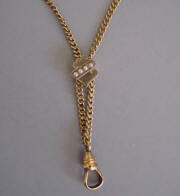 14k GOLD long chains, slides and men's chains. 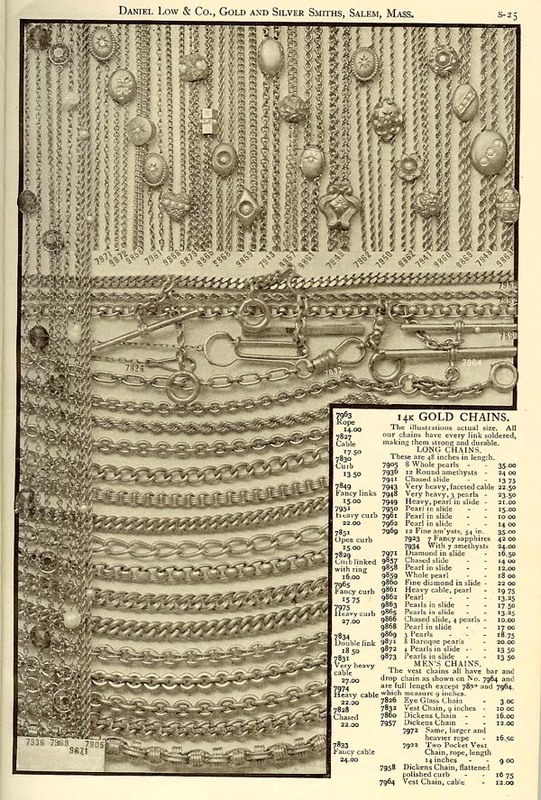 "Our chains have every link soldered, making them strong and durable". 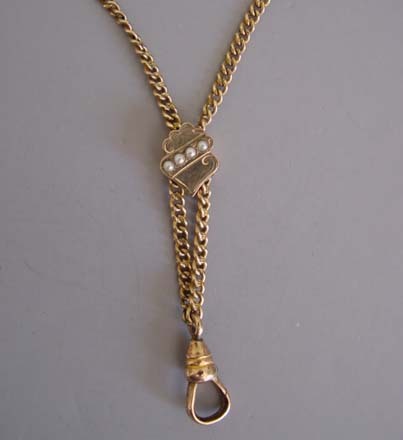 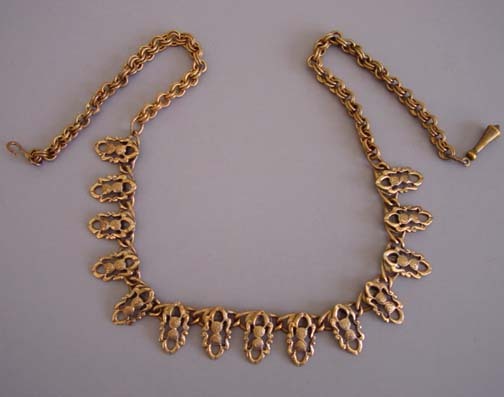 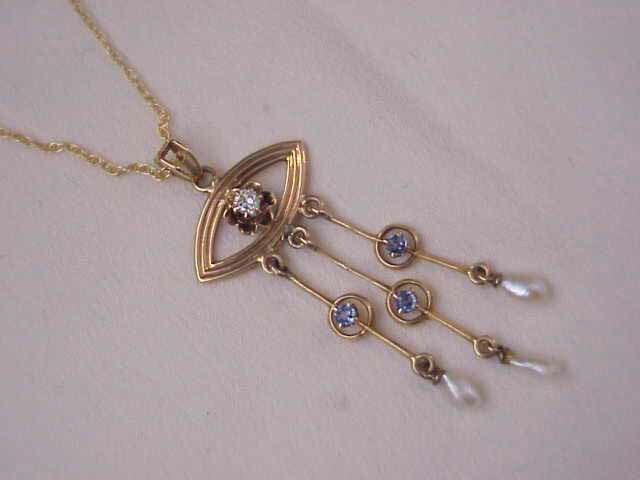 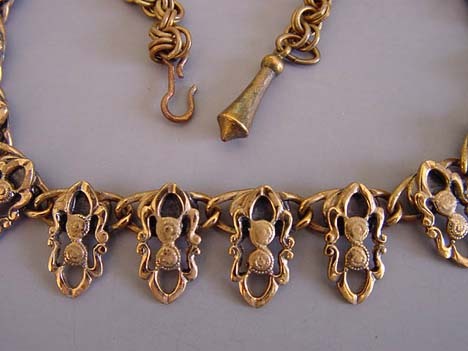 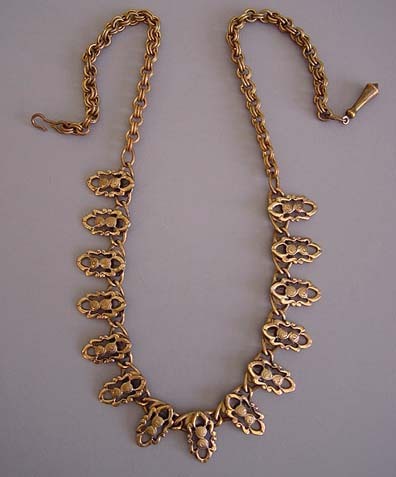 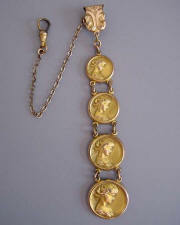 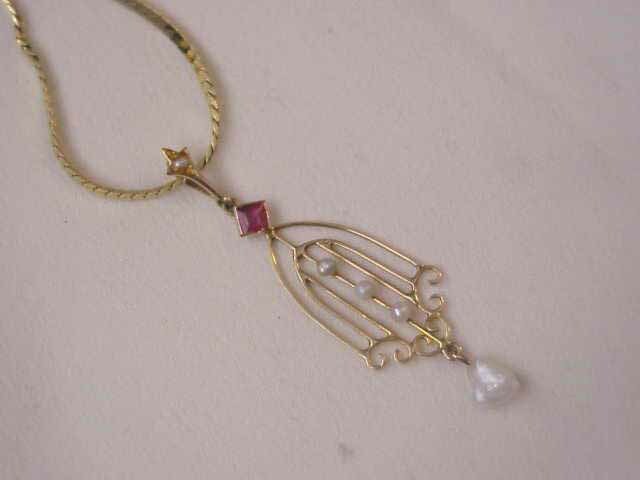 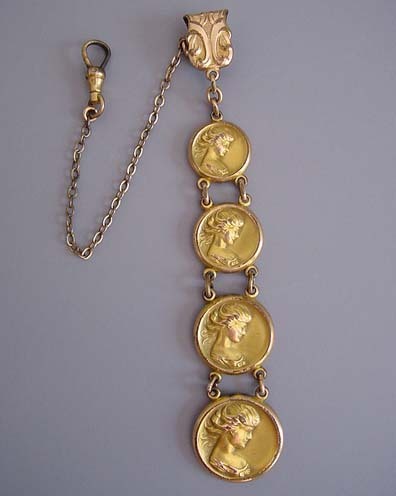 LORGNETTE chain, F&C Co gold filled 48" chain with 1/3" seed pearl slide, circa 1900. 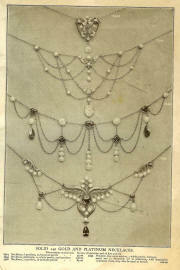 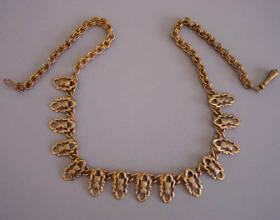 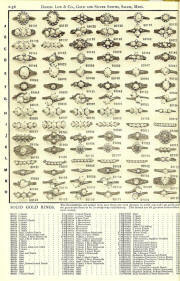 View #Q25386 14k GOLD brooches and long chains; 14k bead necklaces; 14k collar spreaders and 14k gold neck chains. 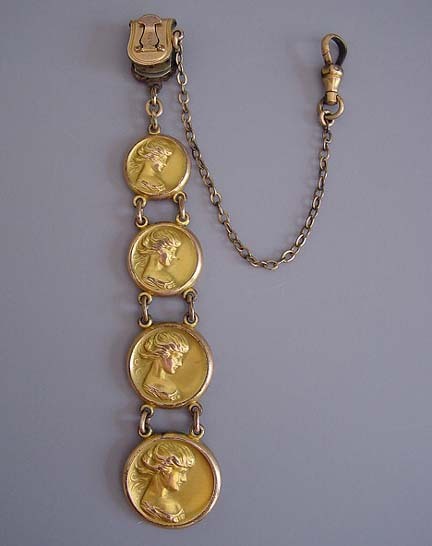 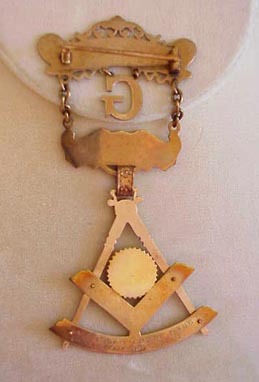 GOLD fobs with bar chains and top swivels on ribbons. 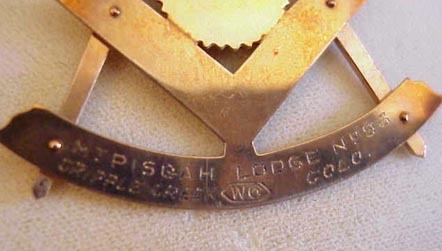 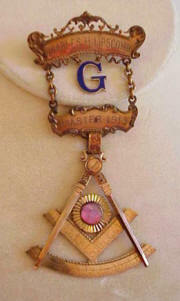 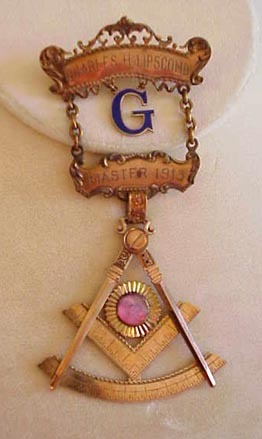 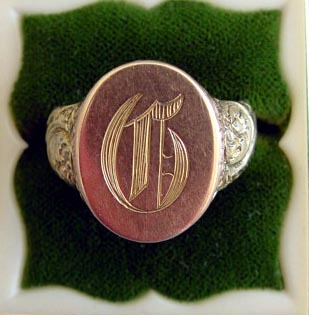 Stones include bloodstone, seals and monograms. 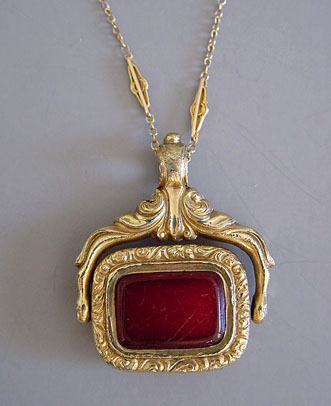 VICTORIAN 9 carat 1-1/8" flip fob of agate and carnelian on a 16" chain. 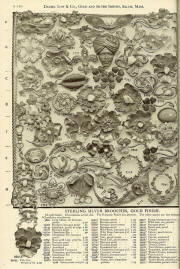 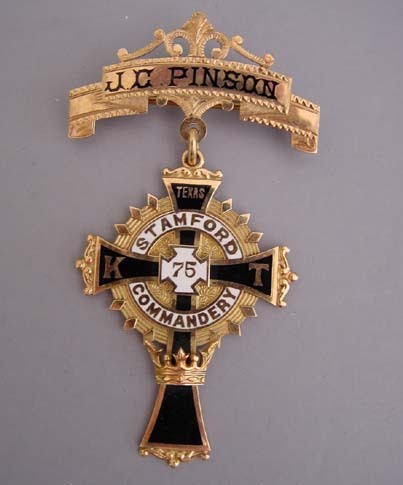 View #V23421 STERLING fobs. 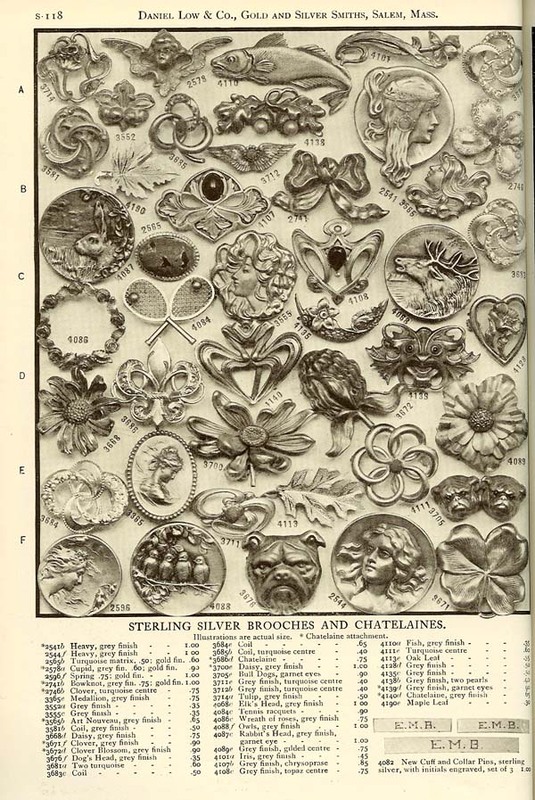 STERLING silver brooches and chatelaines. 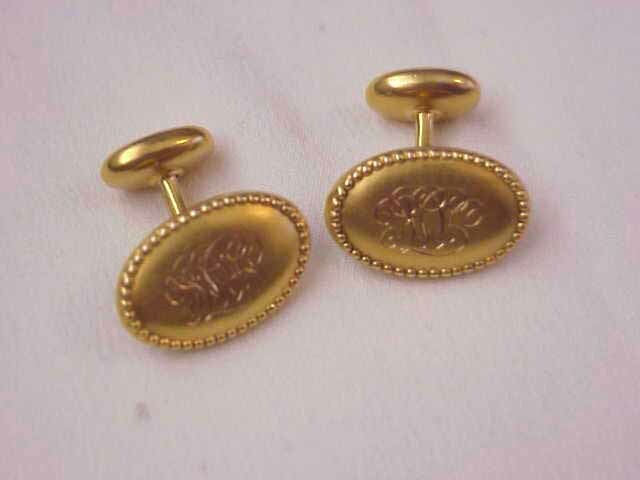 14k SPRING back studs, tie holders and cuff links. 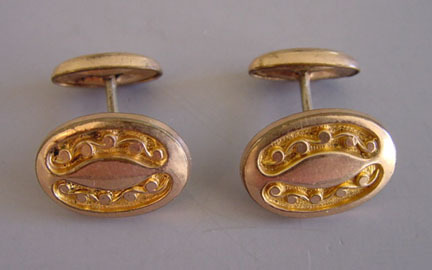 GOLD ladies cuff links with Grandmother's initials, "AJK" and beaded edge, circa 1910. 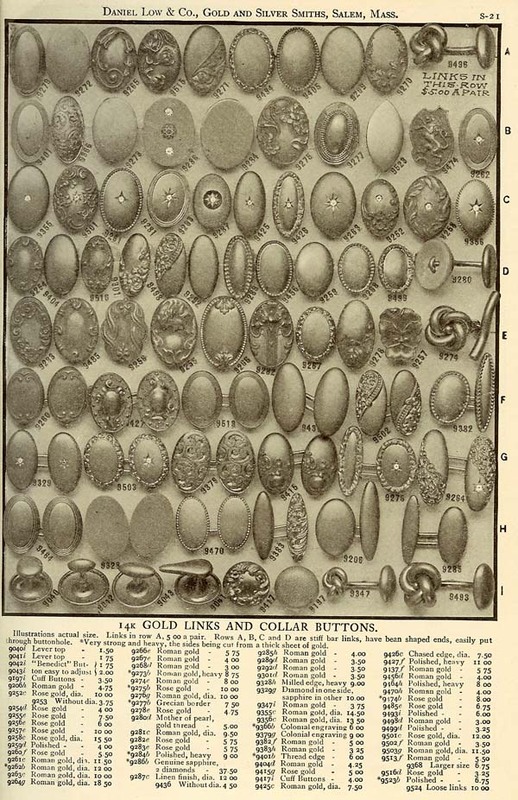 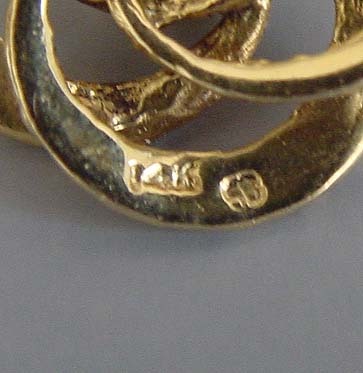 GOLD links and collar buttons. 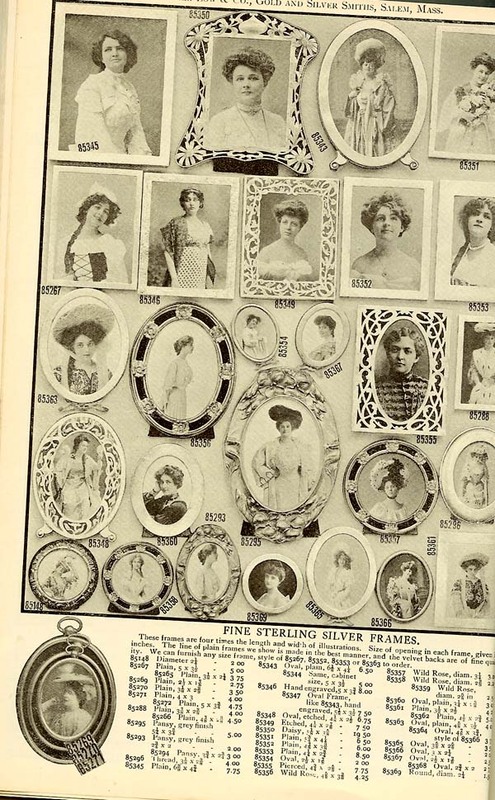 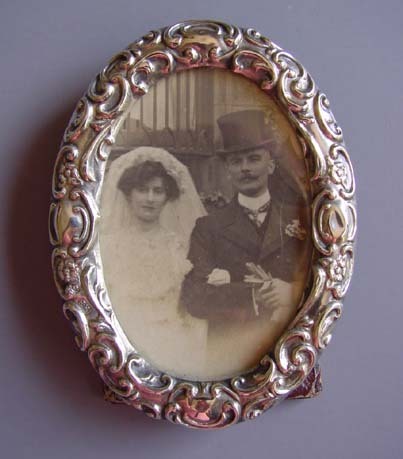 FINE sterling silver frames. 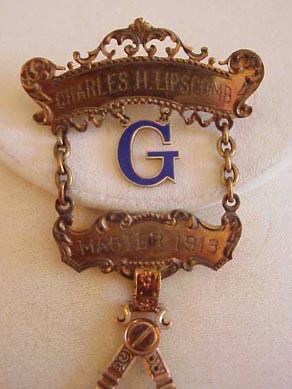 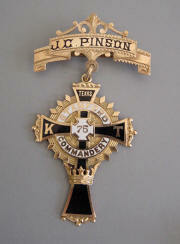 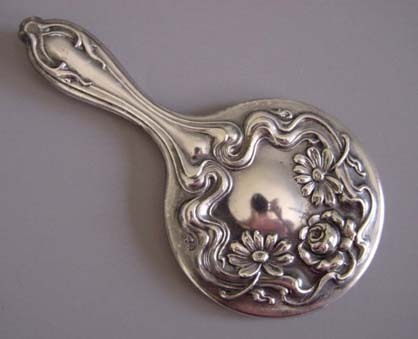 VICTORIAN sterling hallmarked "R.P." scroll embossed oval photo frame circa 1902, 3-1/8" by 2-1/2". 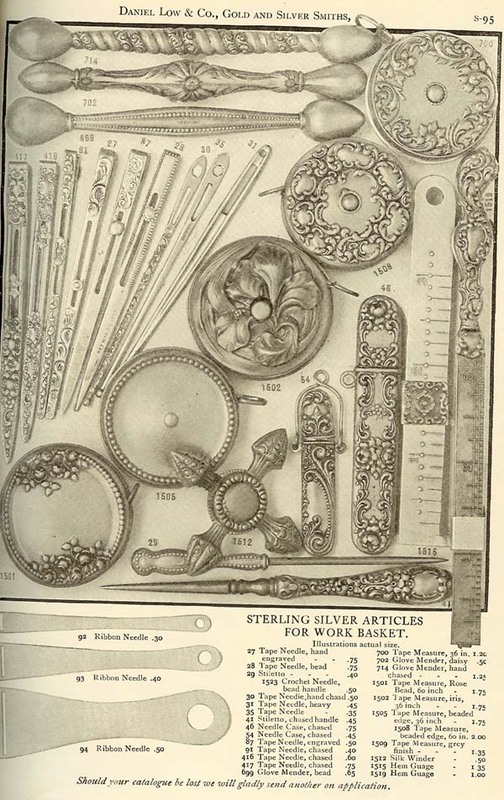 View #a28615 STERLING silver sewing items for the work basket. 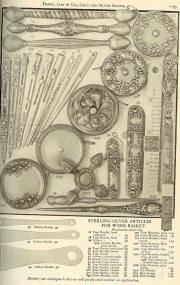 STERLING desk, dresser and sewing accessories. 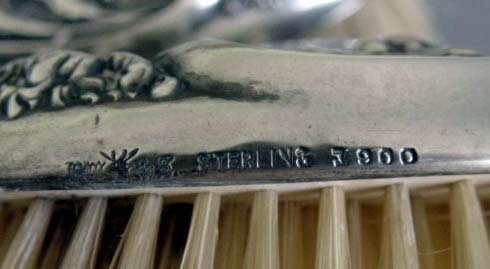 STERLING dresser set. 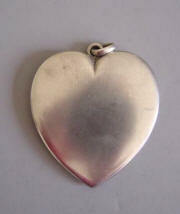 "He Loves Me'. 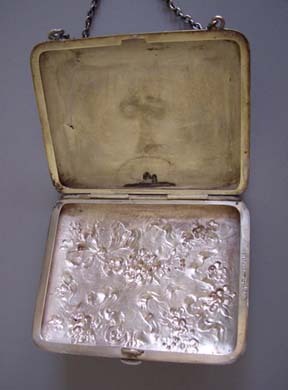 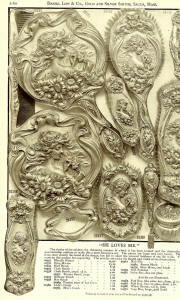 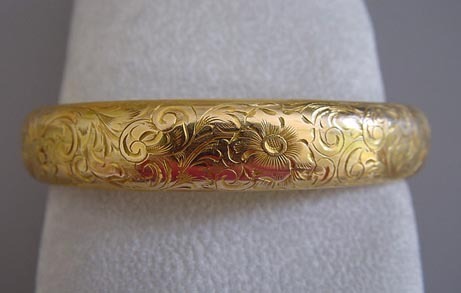 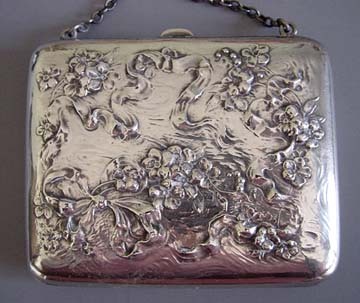 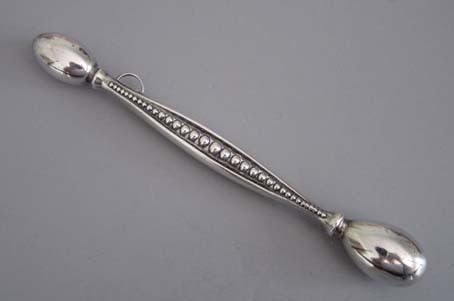 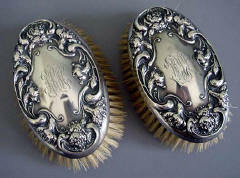 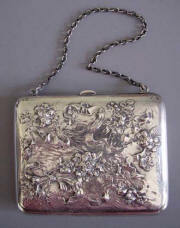 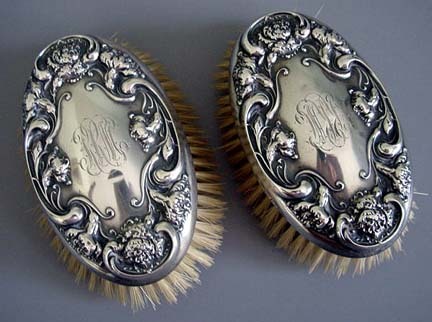 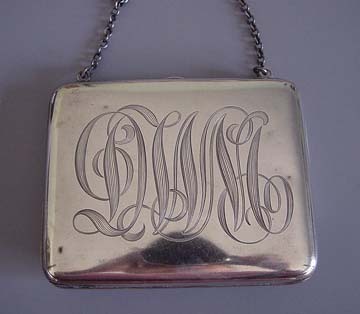 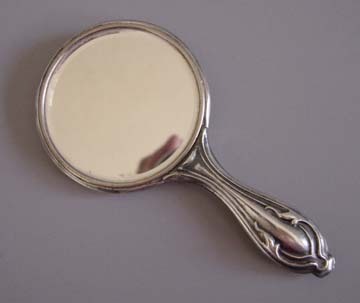 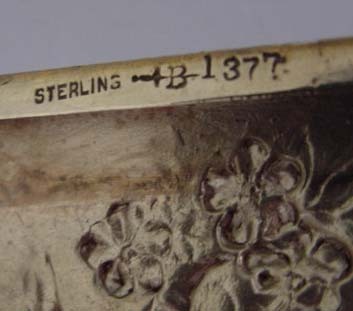 STERLING brushes with repousse carnations motif and engraved initials "RRM", 4-1/2". 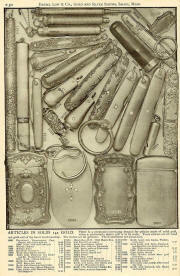 View #A4583 STERLING dresser sets. 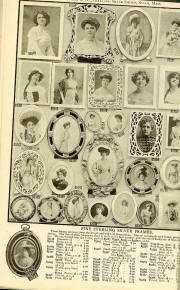 "The Wilhelmina, The Evangeline, The Duchesse and Les Saisons". 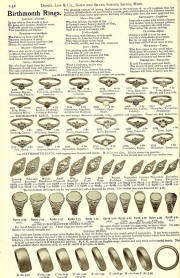 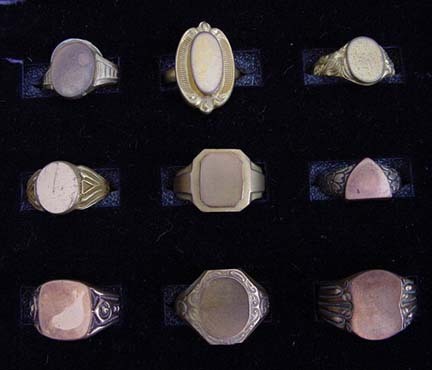 DIAMOND and other precious stone rings. 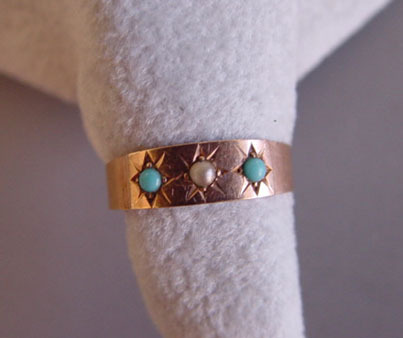 14 KARAT baby ring with Persian turquoise and seed pearls, size 2-3/4. 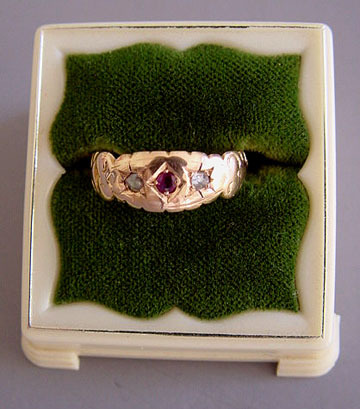 #G23828 SOLID 14k gold rings with ruby, emerald, pearl, opal, amethyst or garnet. 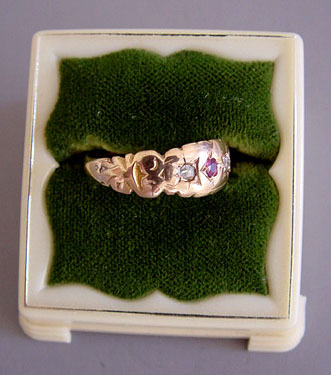 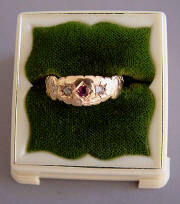 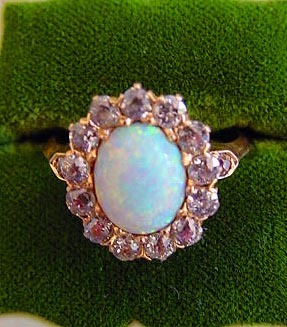 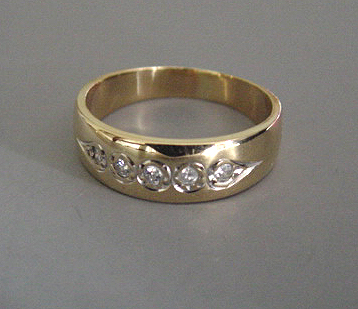 FINE diamond set in 14k gold rings. 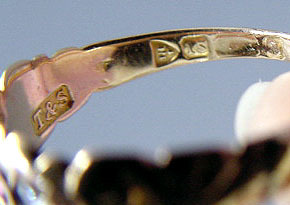 BIRTH MONTH rings. 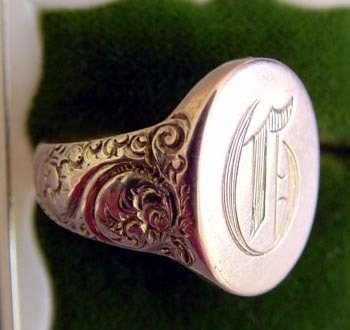 14 K yellow gold heavy signet ring engraved "D/C/G ? 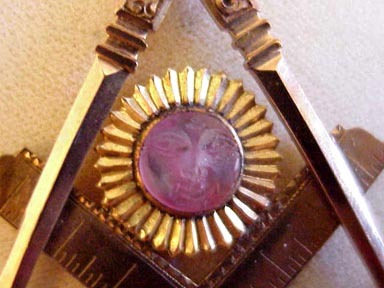 ", size 9, measures 11/16" across the face. 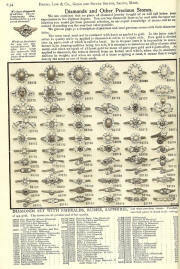 View #G23362 BABY, Misses and boys rings. 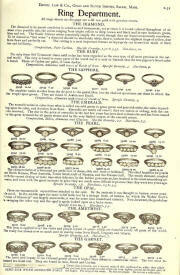 DIAMOND and other precious stone rings. 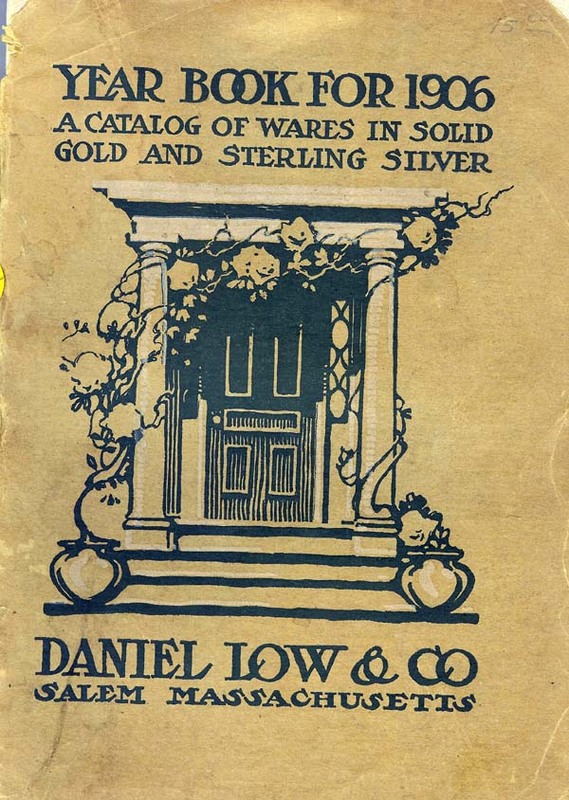 NOTE: According to Dorothy T. Rainwater's book "American Jewelry Manufacturers", the Daniel Low Company was established in 1867, and they began as a little jewelry shop. 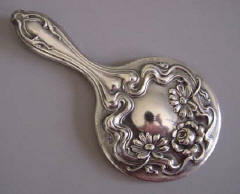 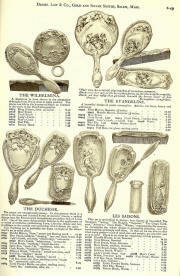 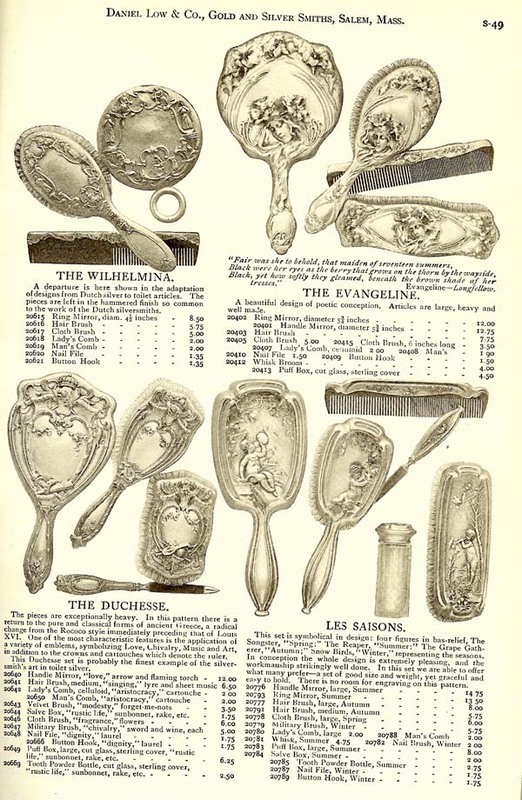 Says Rainwater, "Daniel Low was largely responsible for the spread of the souvenir spoon craze." 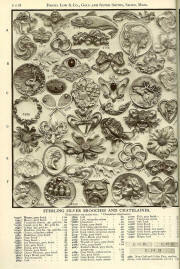 He published his first catalogue in 1893.